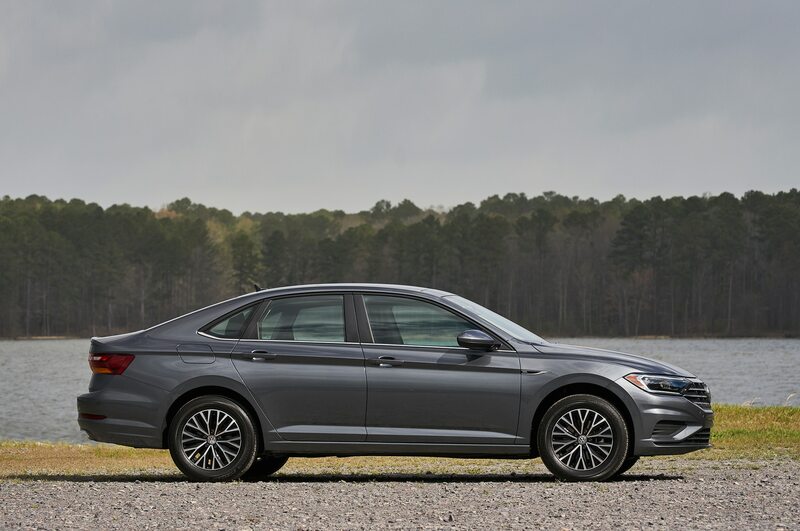 DURHAM, North Carolina — No matter the long-term outcome of the sedan vs. SUV sales clash, you certainly can’t accuse the current batch of four-doors of not trying hard enough. 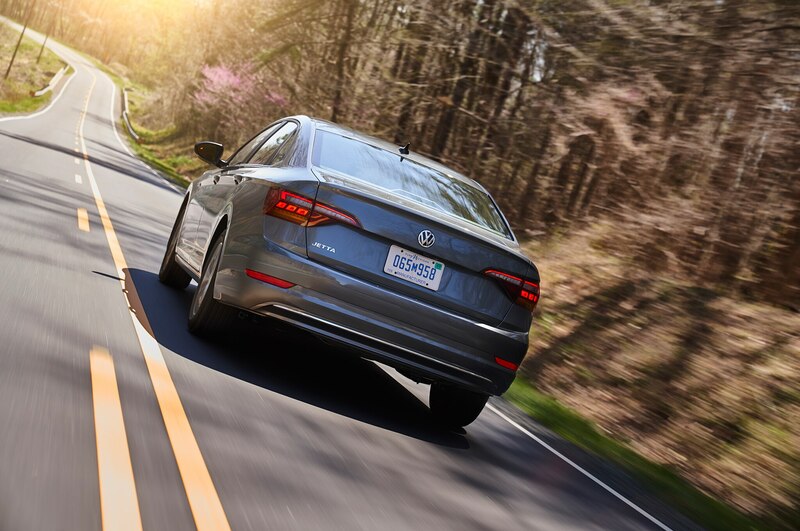 For the moment, the news remains good–there’s still money to be made and new sedans keep rolling off dealer lots, albeit with less enthusiasm than in years past. 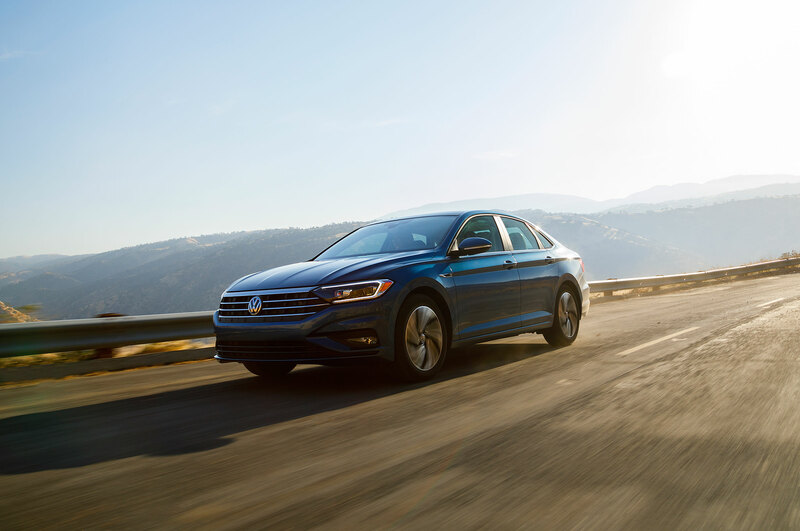 This is especially true for German uber-automaker Volkswagen, whose C-segment Jetta remains the brand’s best-selling model, at least in the States. 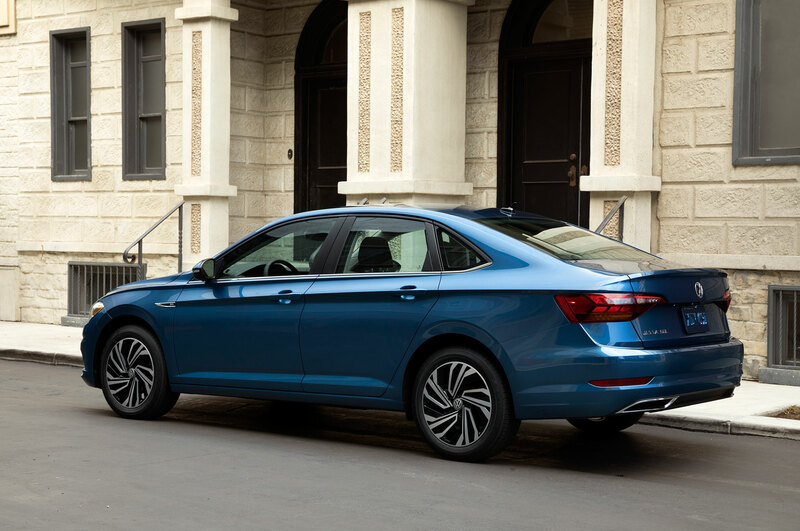 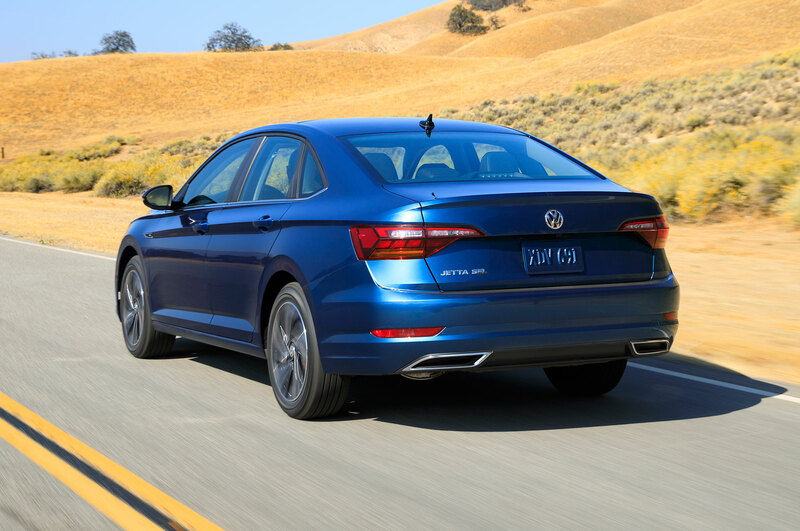 Following big-budget bets on the explosive SUV market with the Atlas and the reworked Tiguan, the brand is momentarily back to cars with the all-new 2019 Jetta. This is the first Jetta to ride on VW’s excellent MQB platform, the same that underpins the Golf, Audi TT, and A3, among many others. 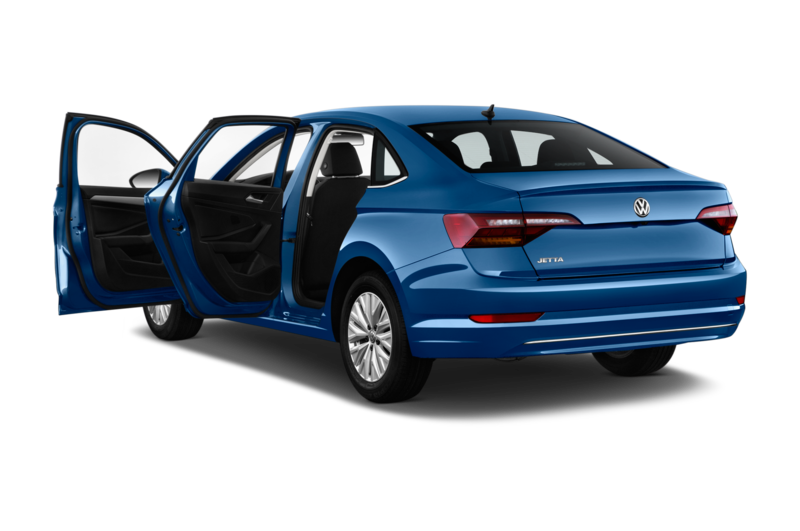 This is one of the better modular architectures currently in production, incorporating relatively dynamic handling with a confident and composed ride. 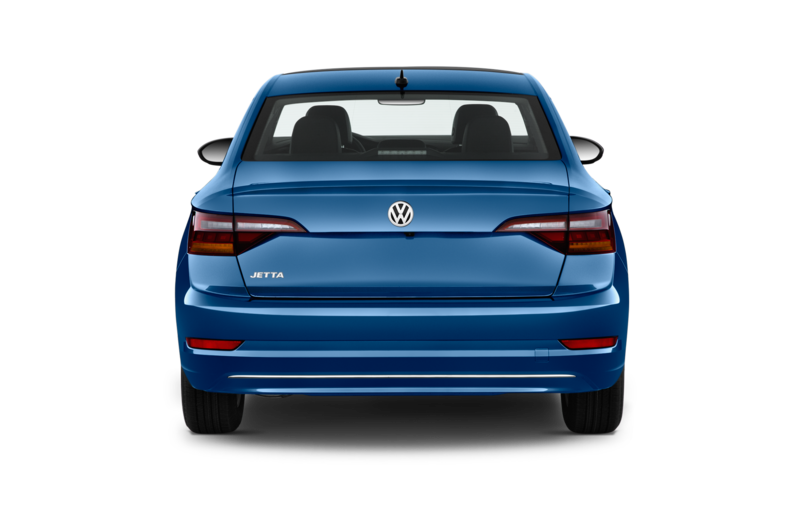 However, this Jetta isn’t just a Golf with a sleeker derrière. 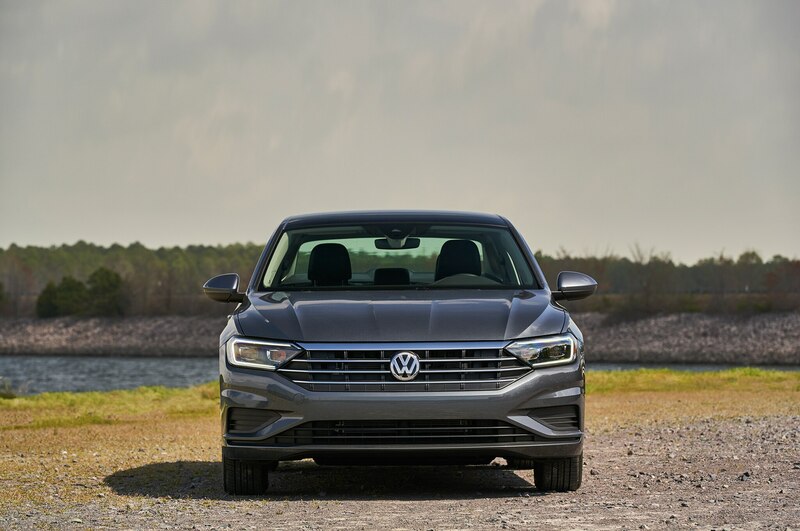 Sure, it rides on the same global platform, but according to VeeDub, this new four-door is specifically designed for the U.S., incorporating a softer ride and larger footprint—inside and out. 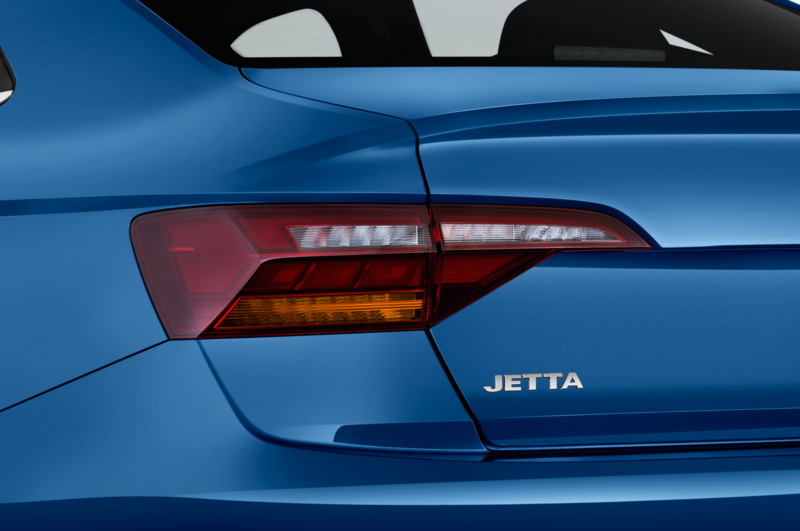 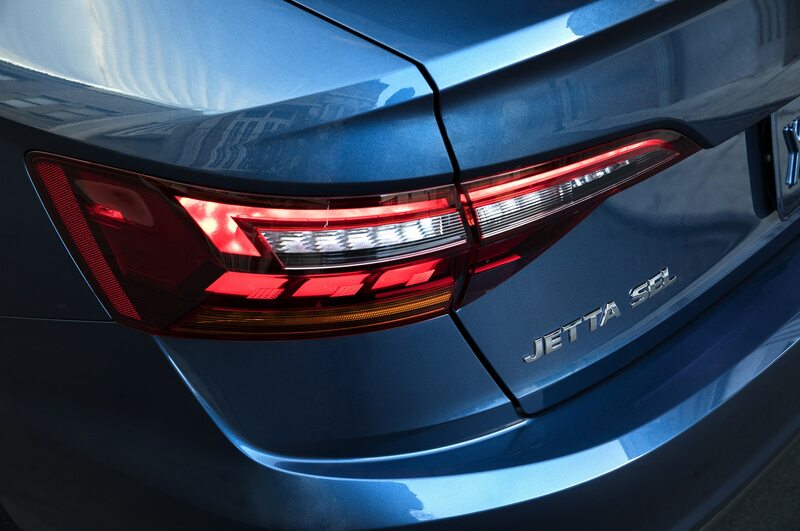 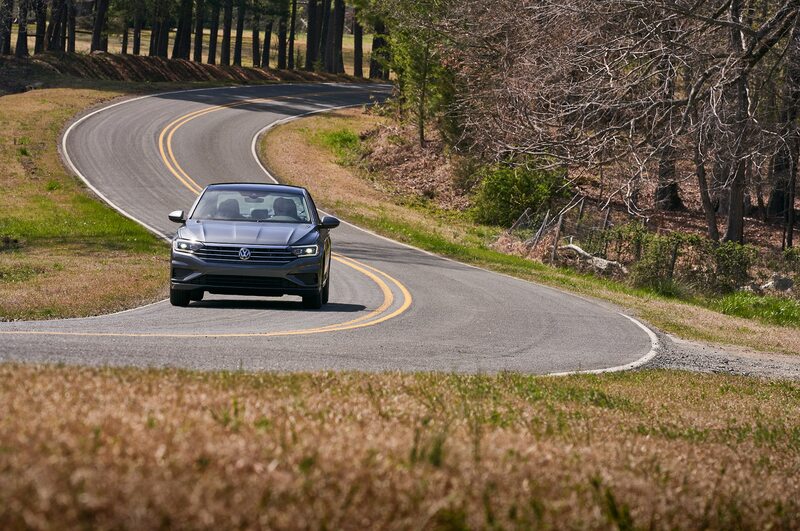 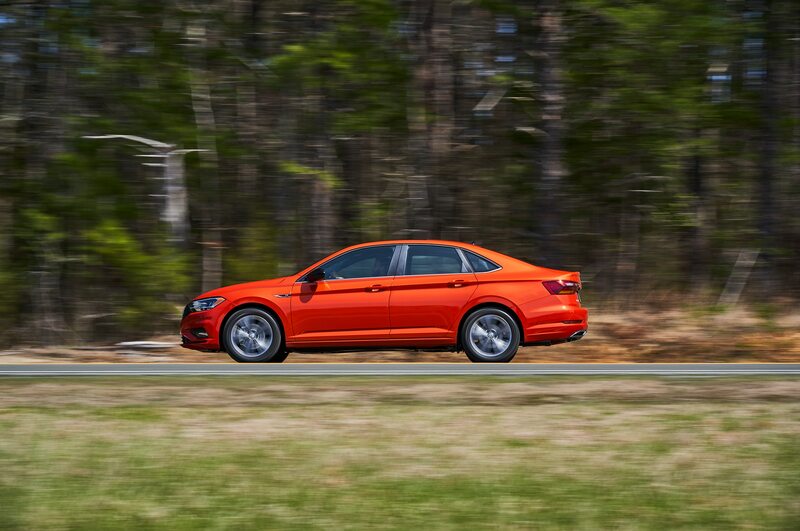 To accommodate America’s apparent appetite for upsizing, the new Jetta is larger than ever. 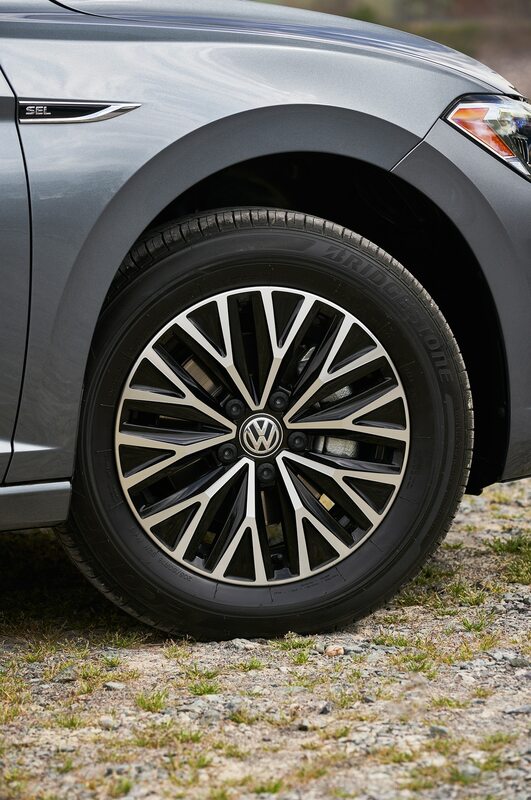 It’s 1.3-inch longer, 0.8-inch wider, 0.2-inch taller, and its wheelbase has been stretched by an extra 1.3-inches. 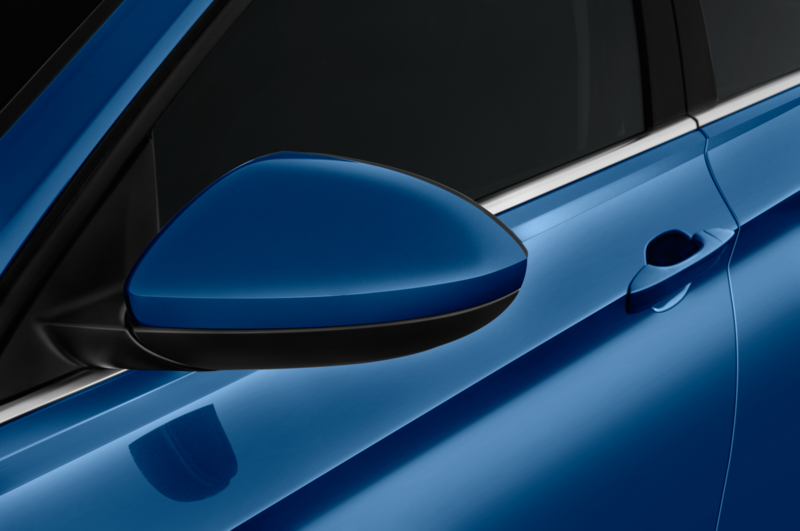 Unlike supersized Americans, this new girth isn’t detrimental to its profile – it’s slipperier than the old car, cutting the drag down from 0.30 to 0.27. 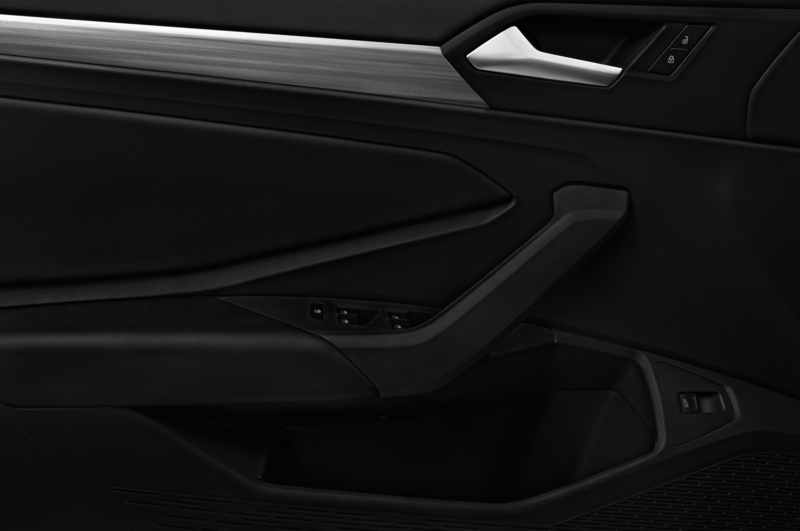 The new threads look snazzier, too. 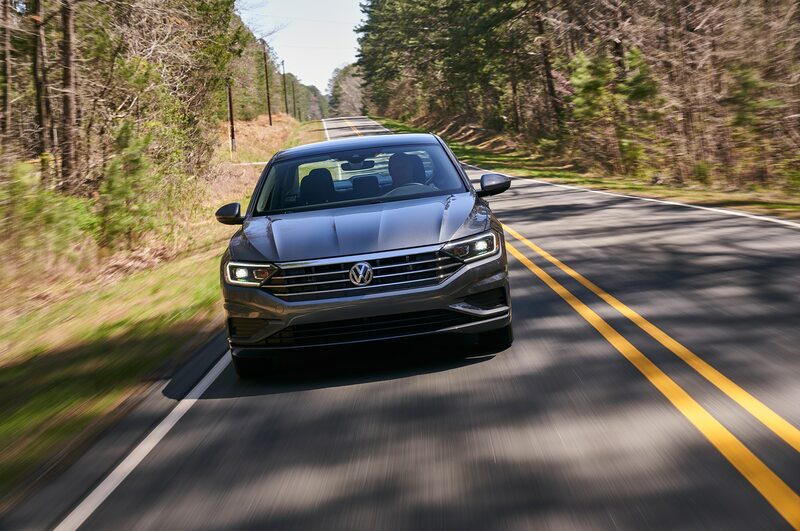 In a gentle attempt to dust off a tiny bit of typical VW austerity, the design team incorporated a sleeker front grille and added a number of noticeable style lines that run the length of the hood and body, culminating In a sharper rear profile—think of it as a scaled-down Arteon. 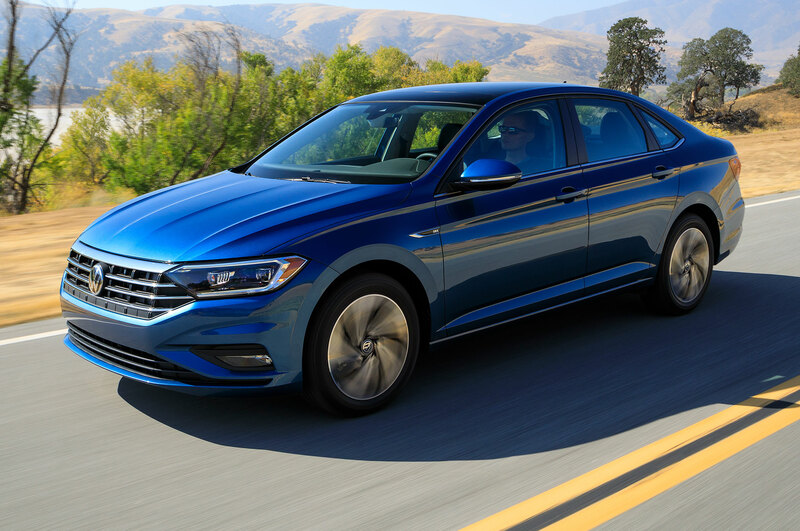 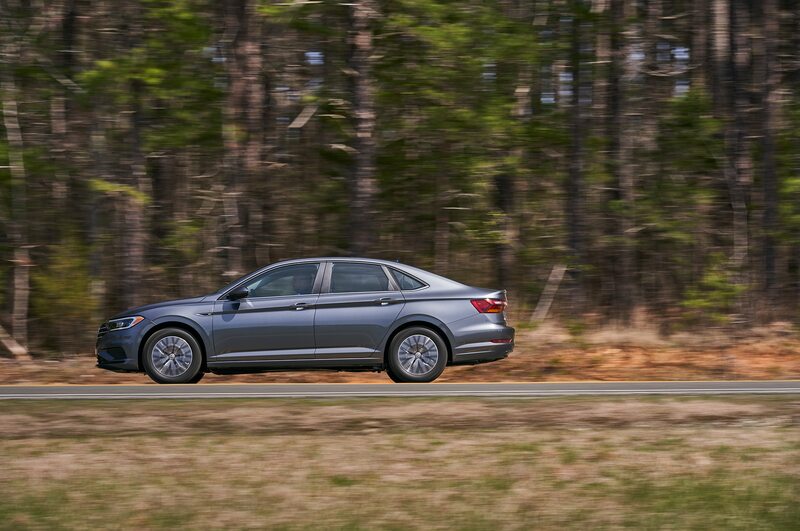 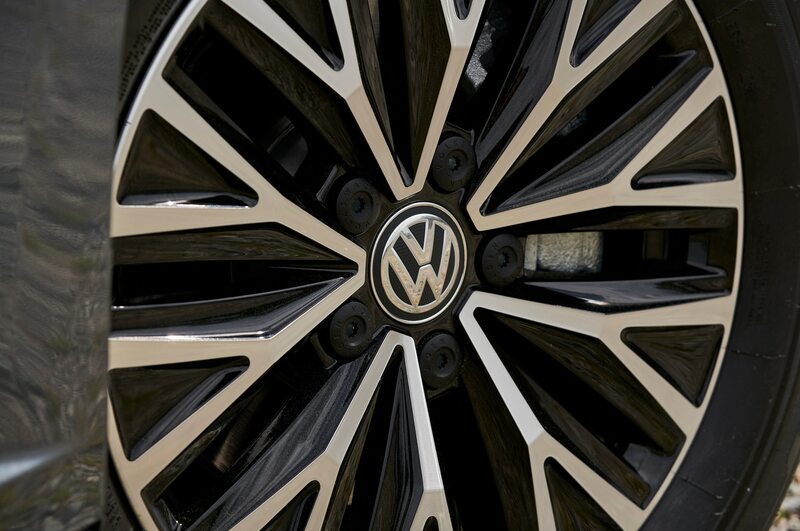 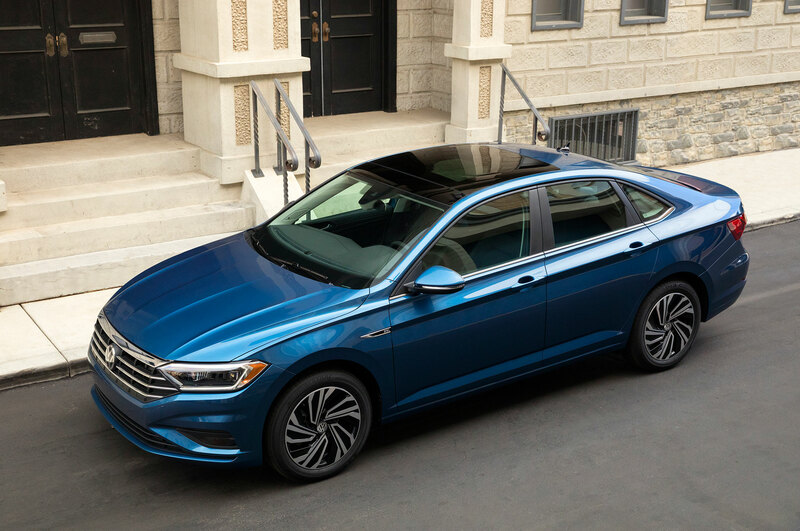 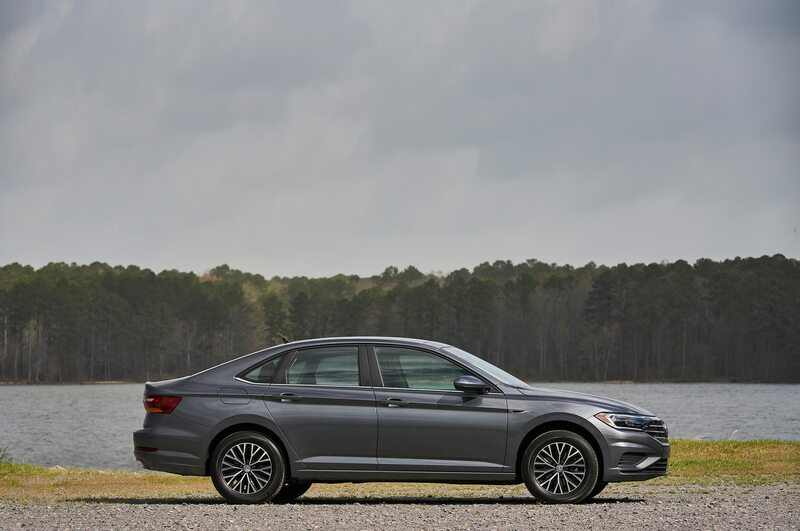 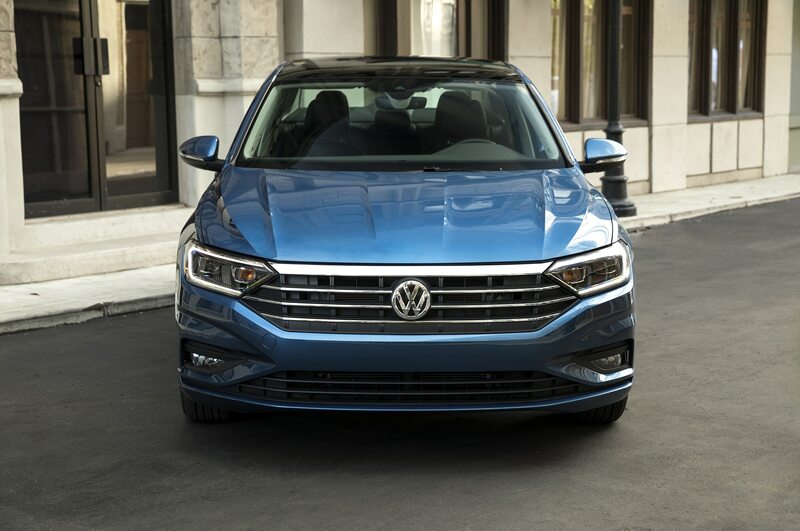 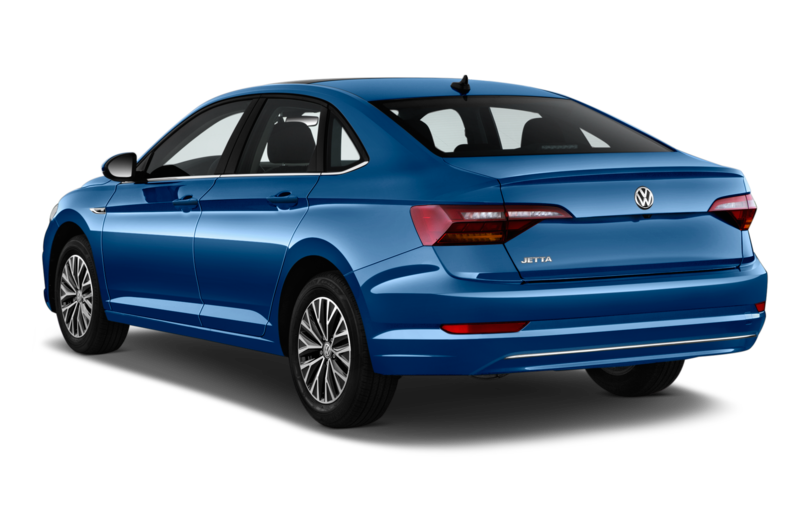 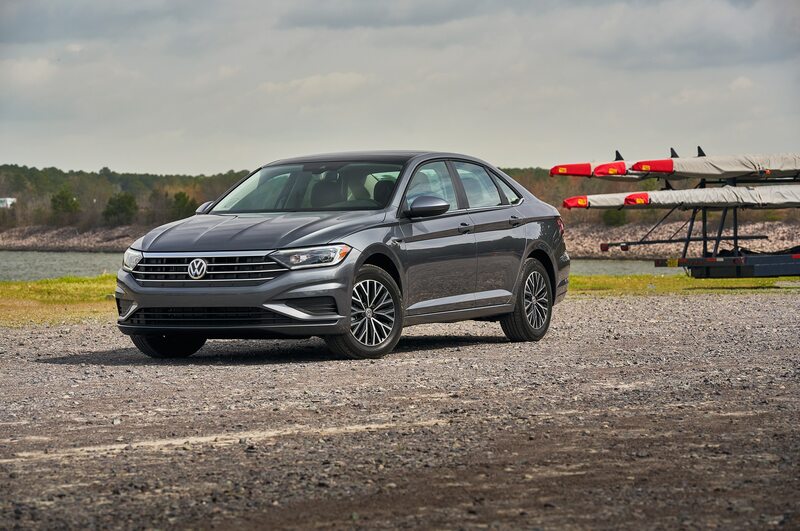 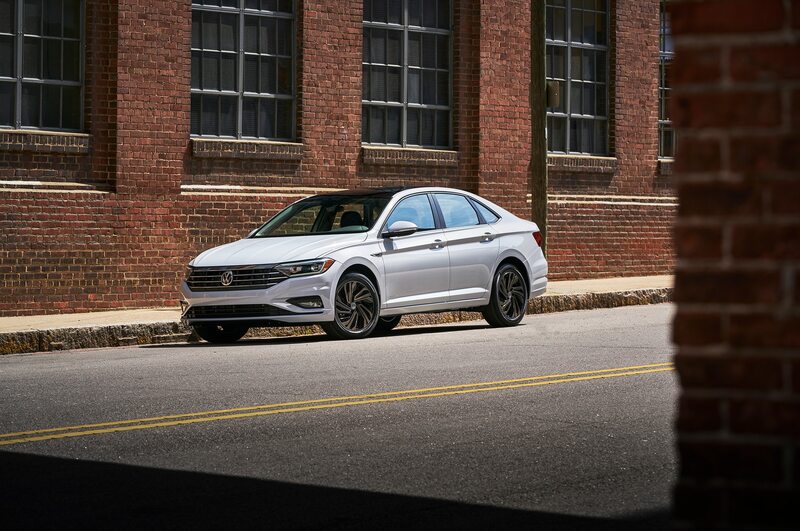 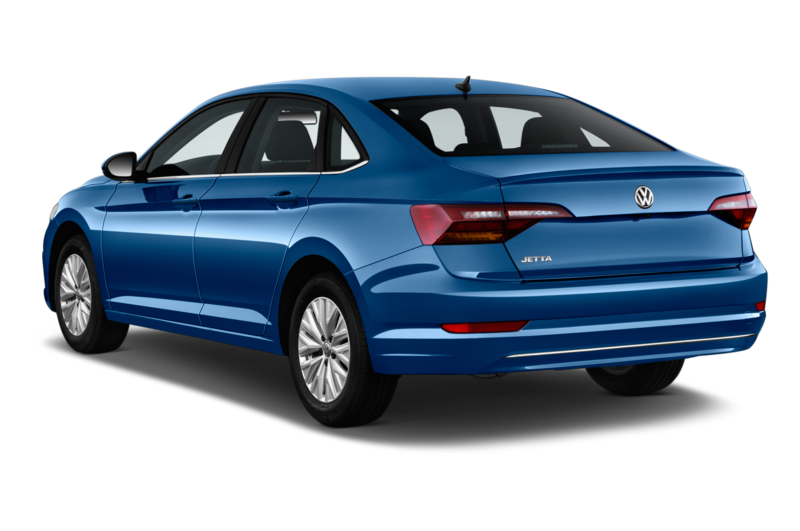 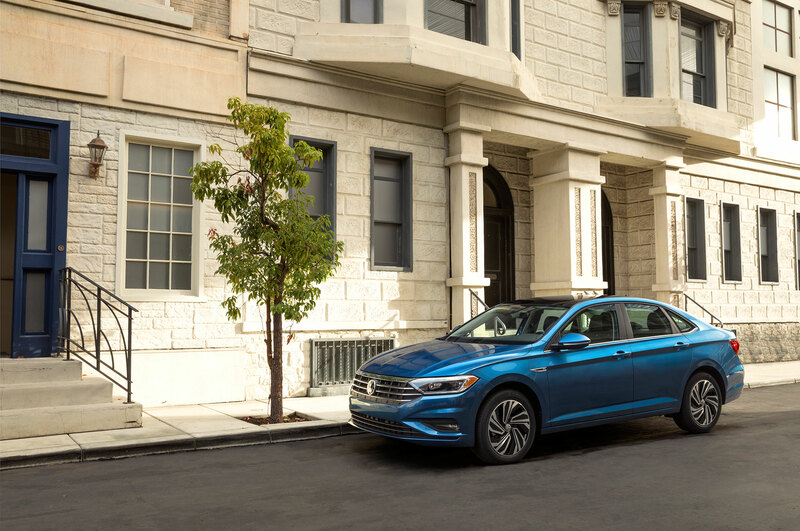 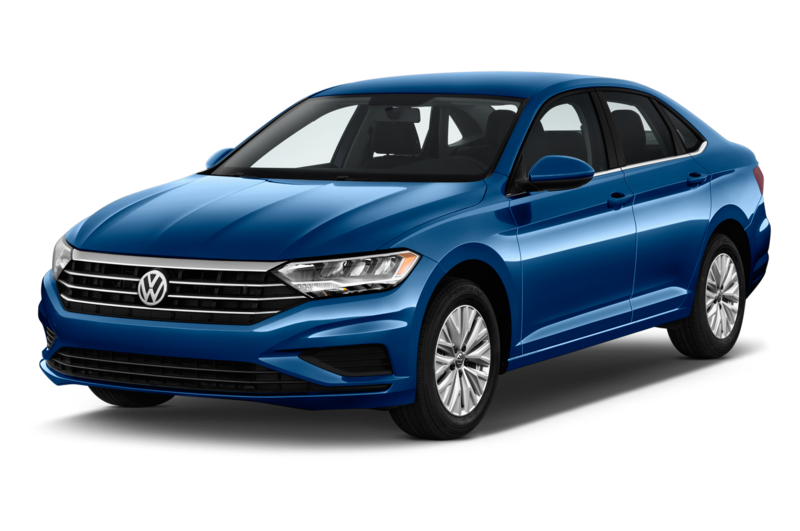 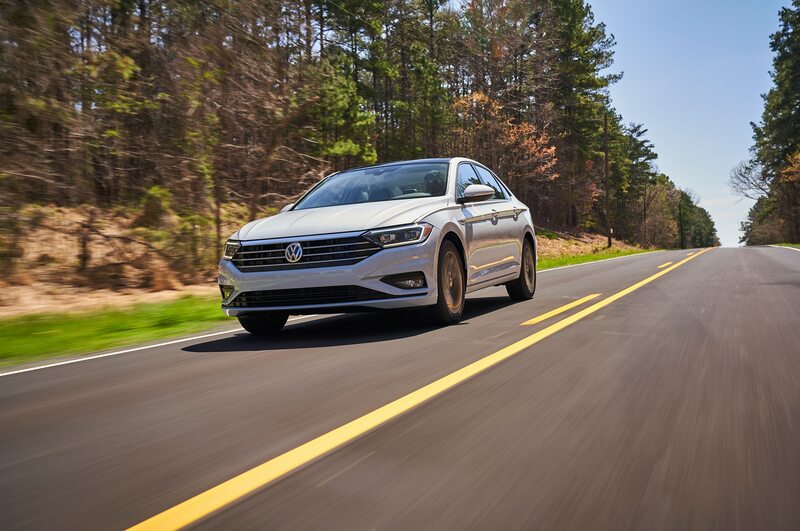 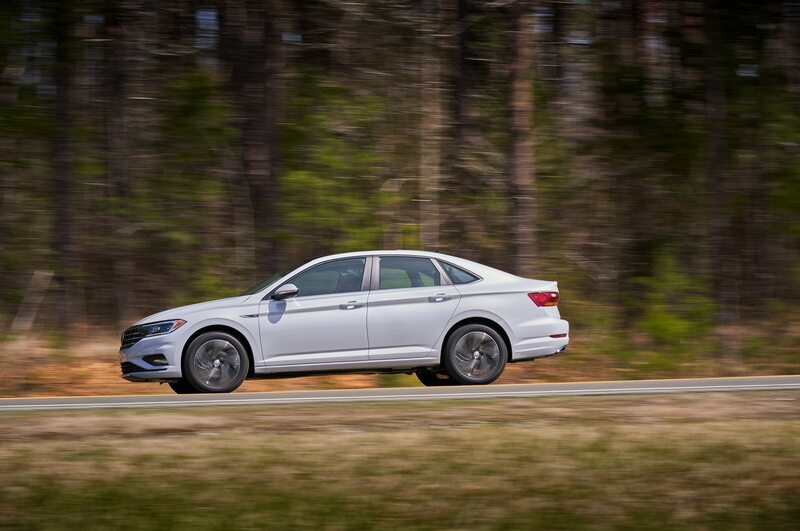 Outfitted with the optional R-Line appearance package that adds black trim, revised rear bumper, new differential, and upgraded alloy wheels, and the Jetta is one of the visual standouts in the segment. 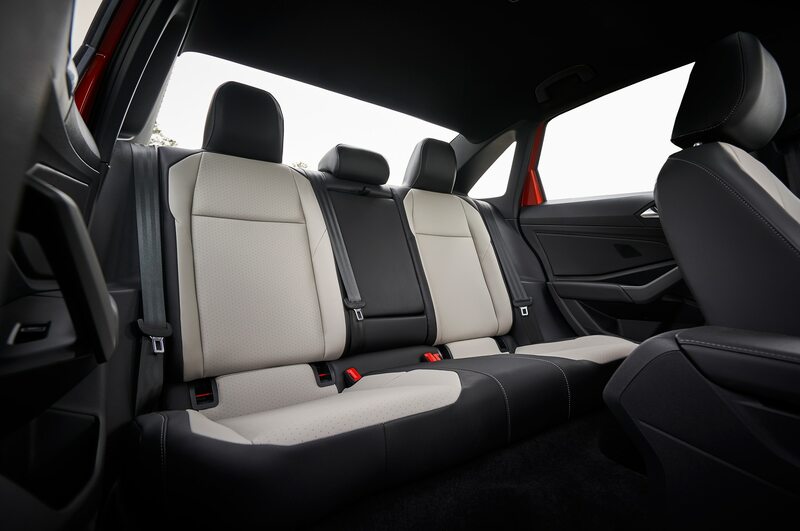 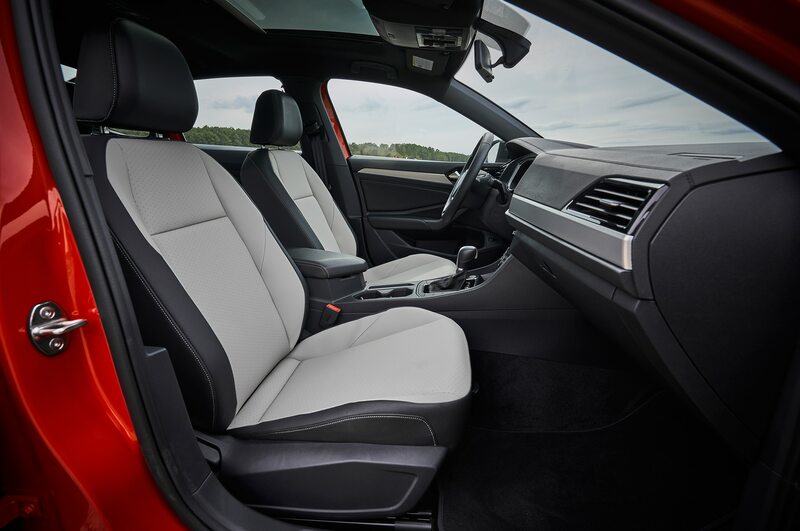 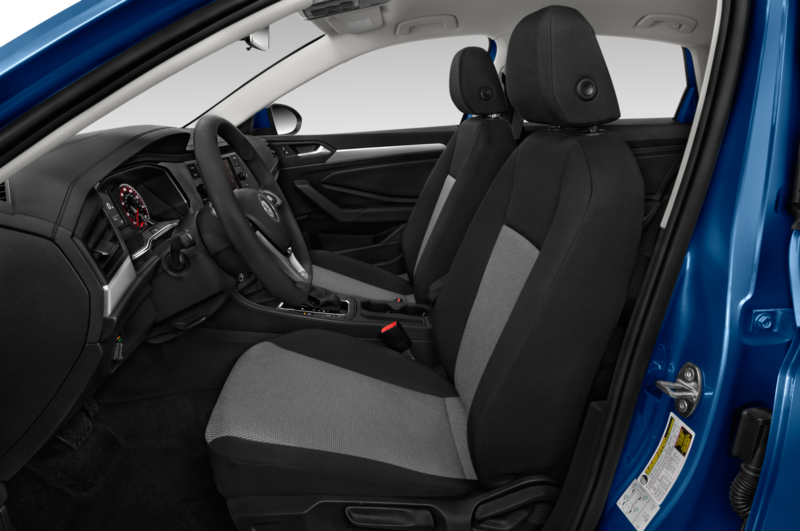 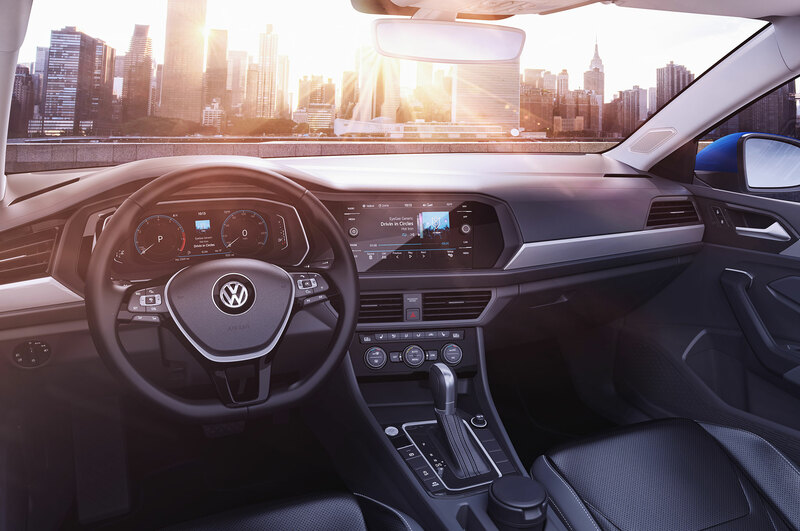 Volkswagen is still king of low-rent, high-impact interior. 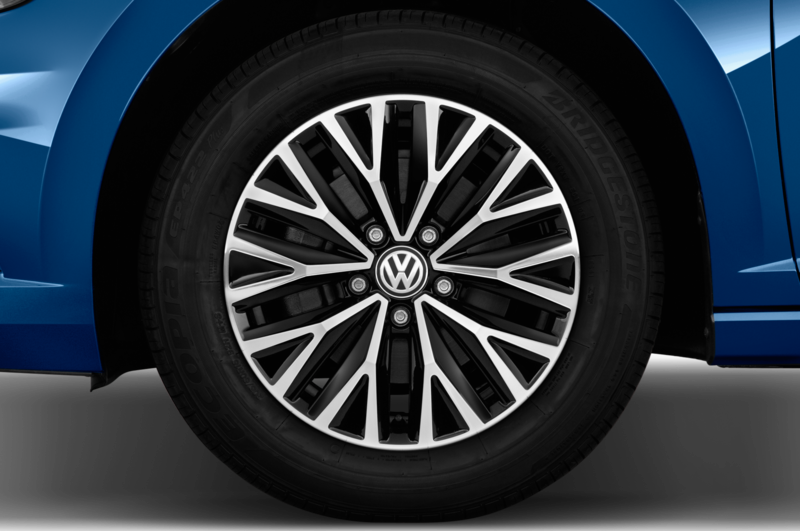 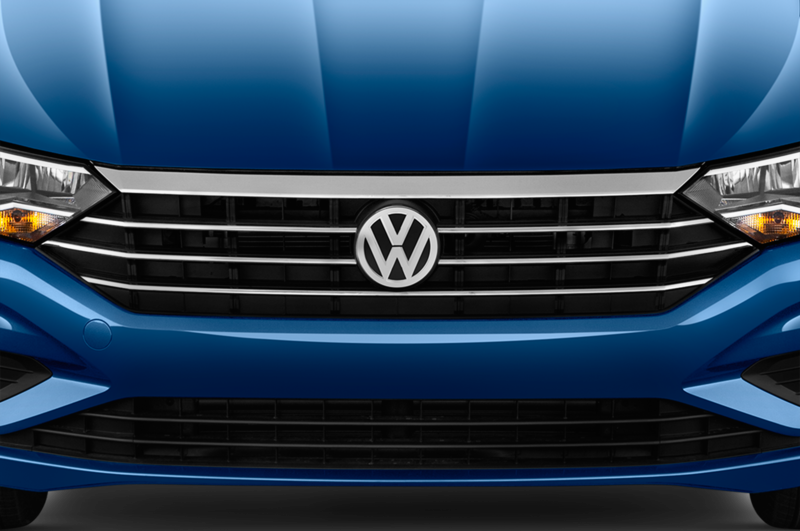 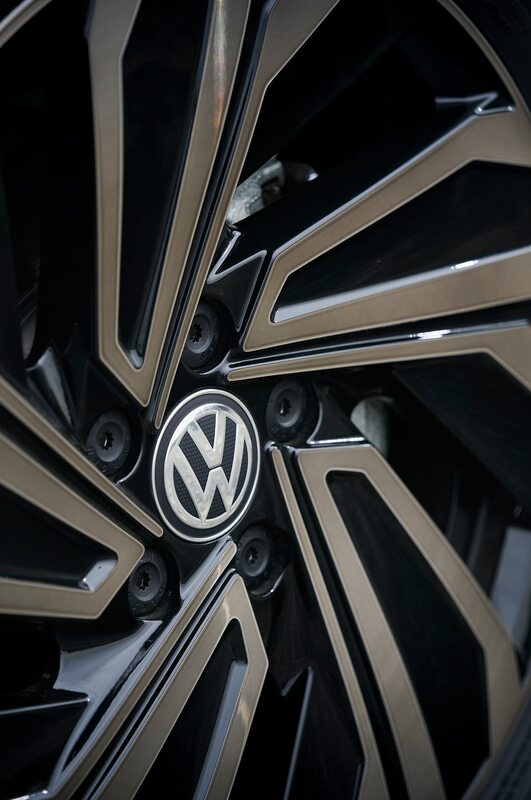 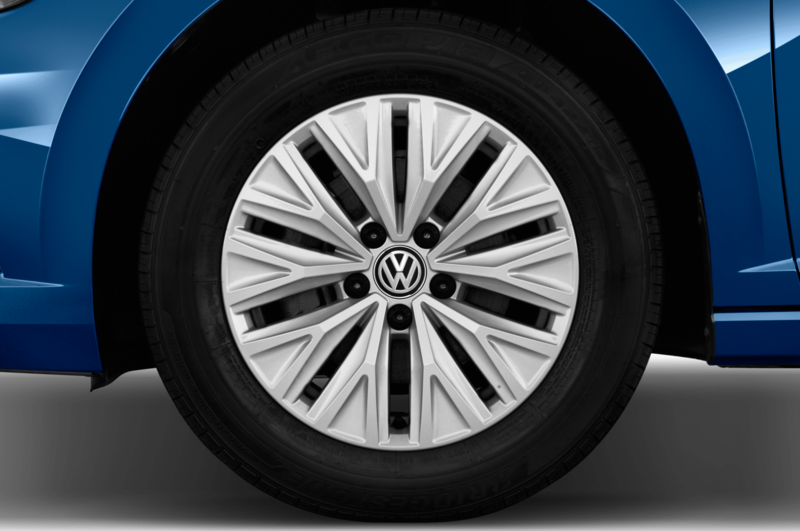 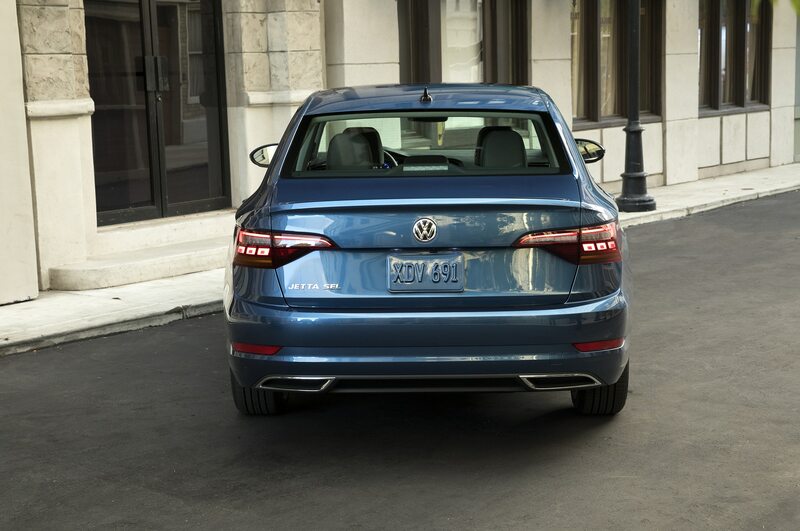 It’s budget chic, with that intangible European design that pervades the entire VW lineup. 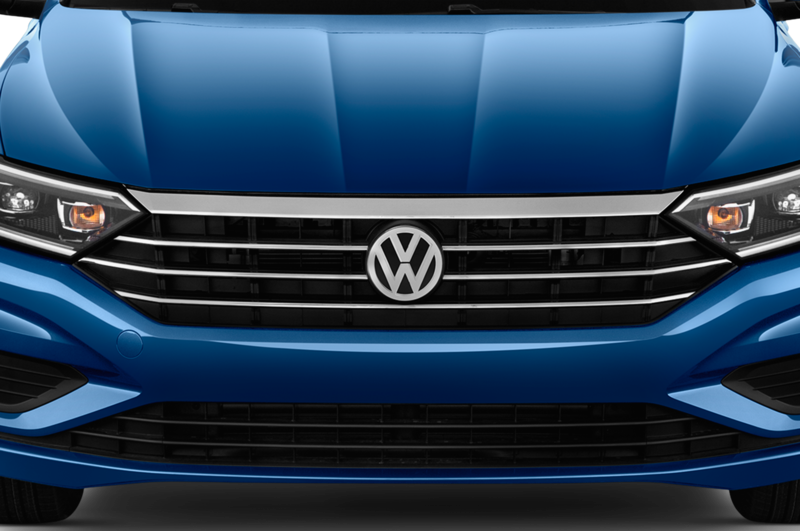 It’s reserved and serious without being severe, like Helvetica. 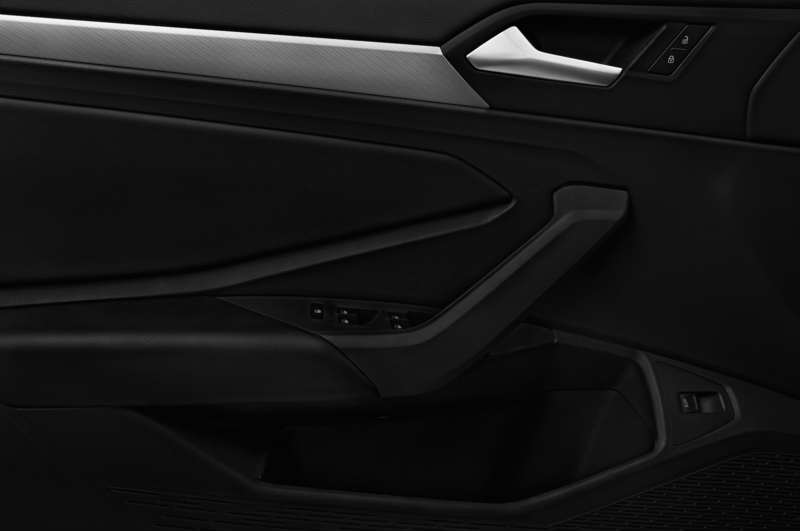 There are still acres of black plastic, but most of it is either matte or soft-touch. 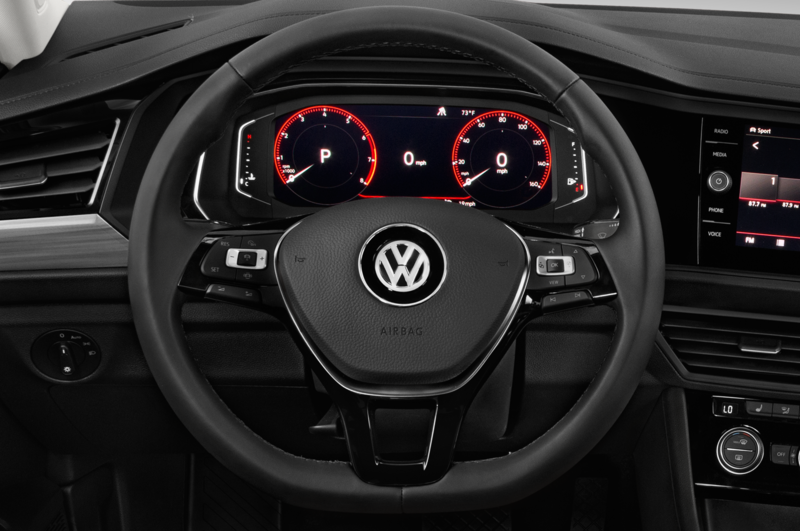 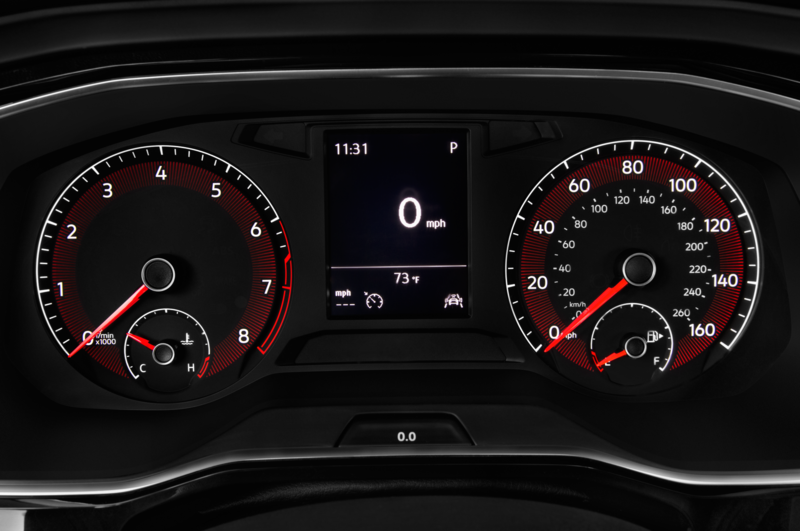 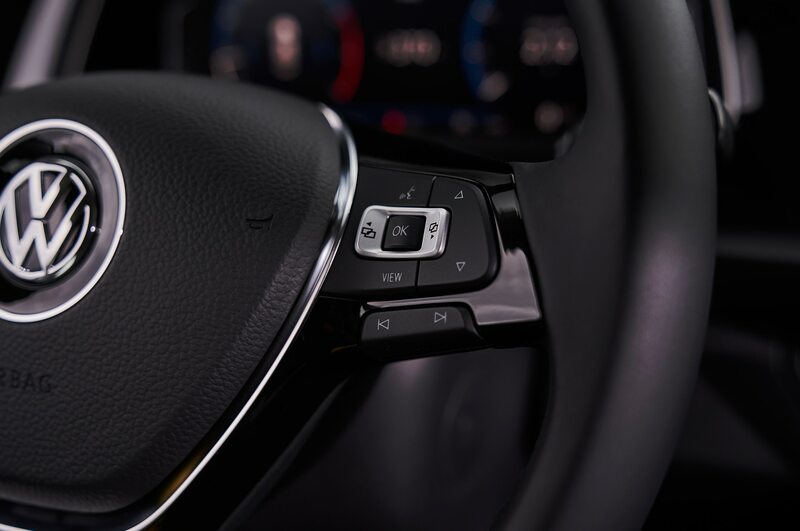 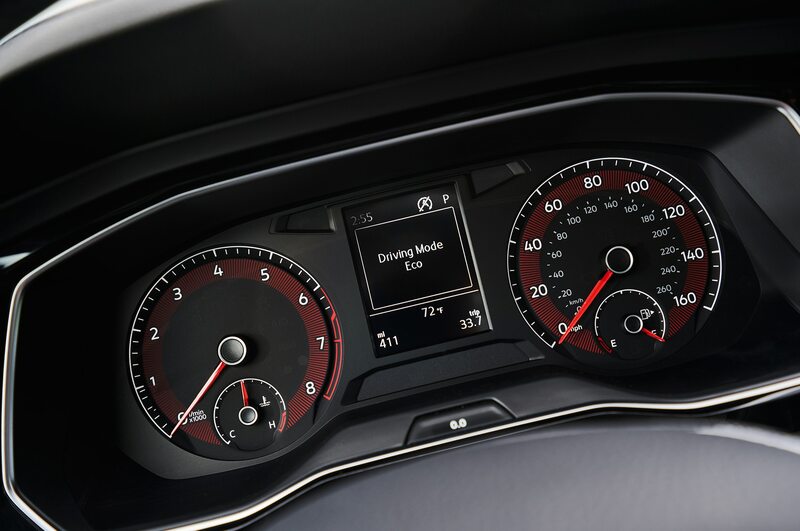 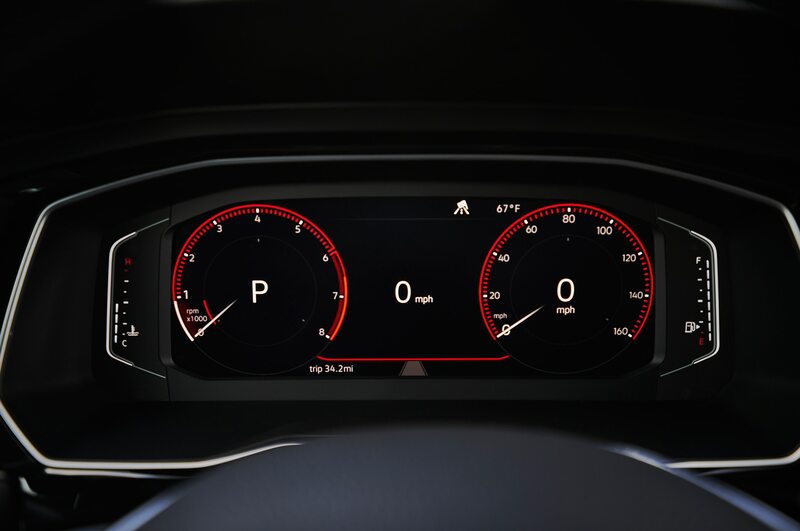 It’s clever too, especially with the optional VW Digital Cockpit that takes the place of the traditional gauge set. 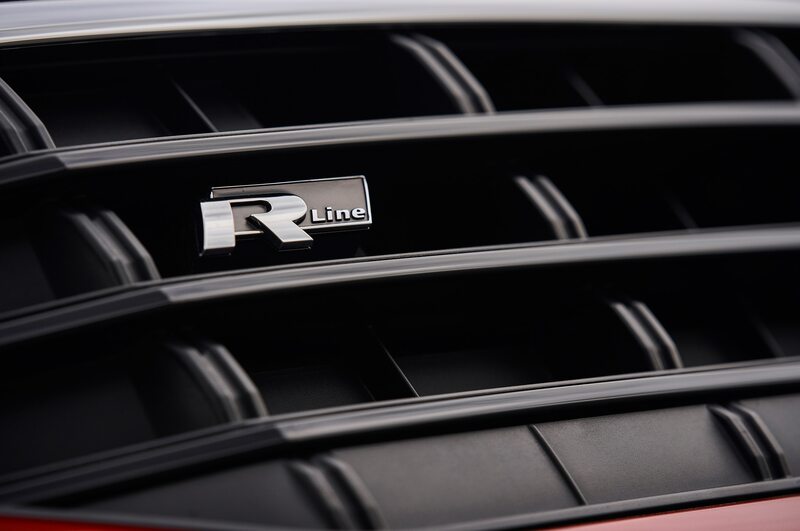 It’s very similar to Audi’s system of the same name. 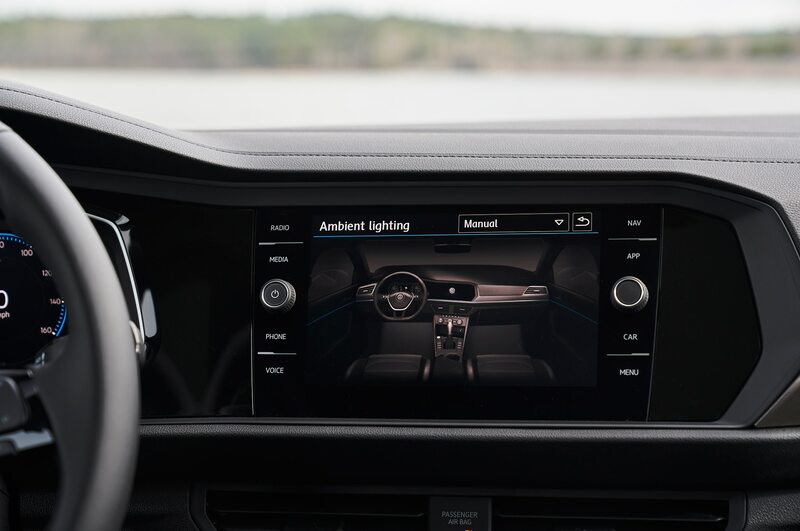 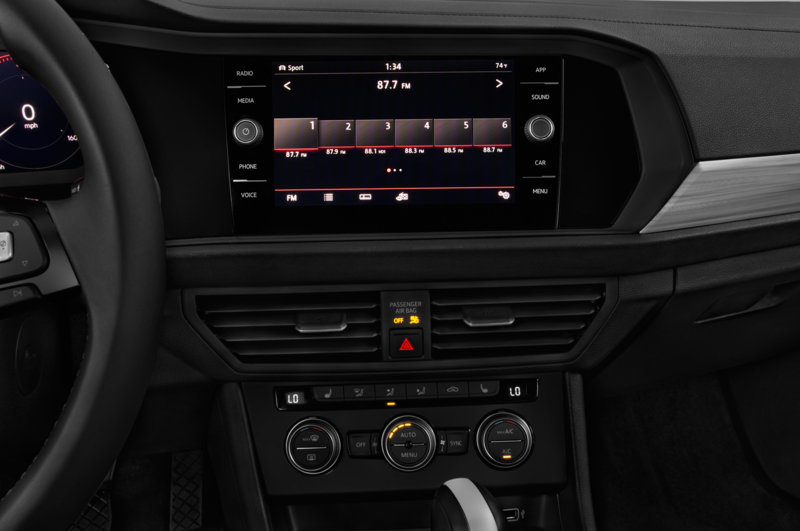 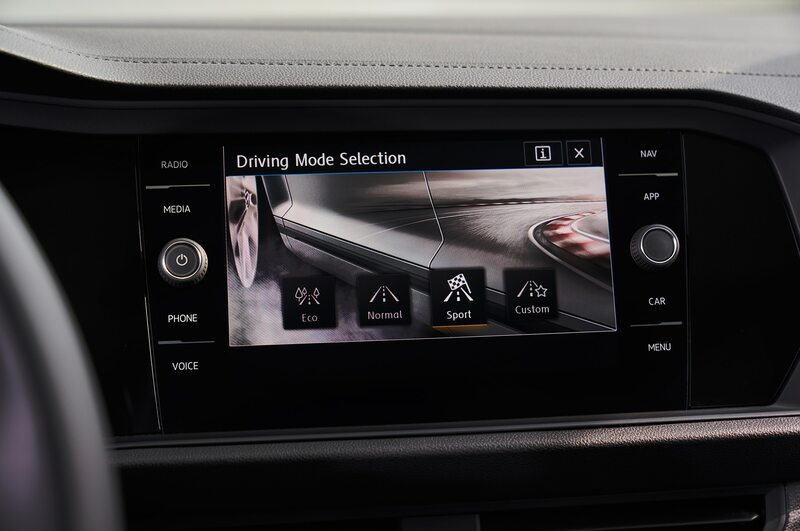 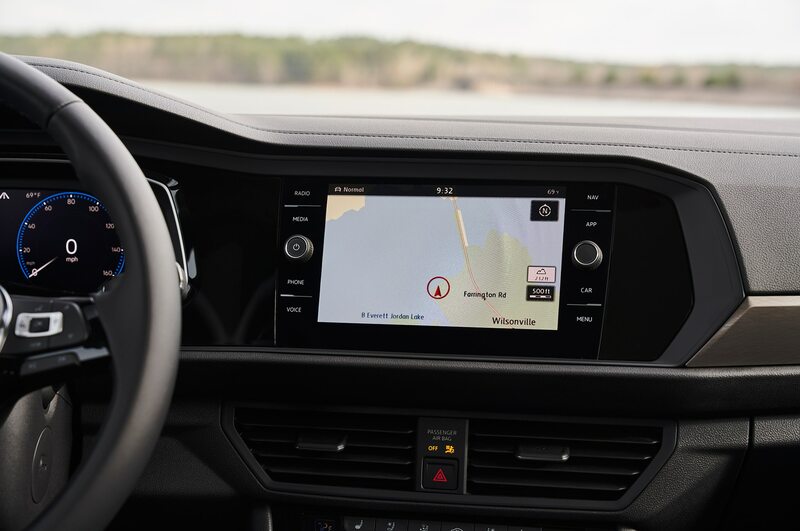 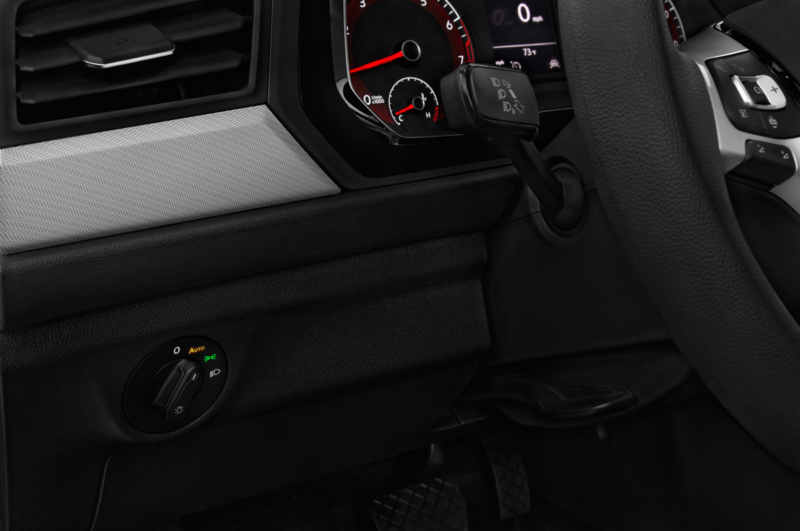 For other infotainment needs, an optional eight-inch screen fills the center console. 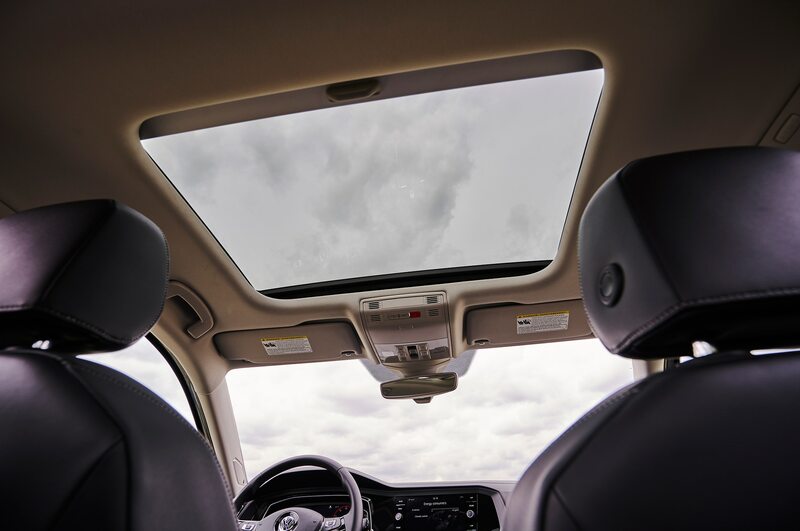 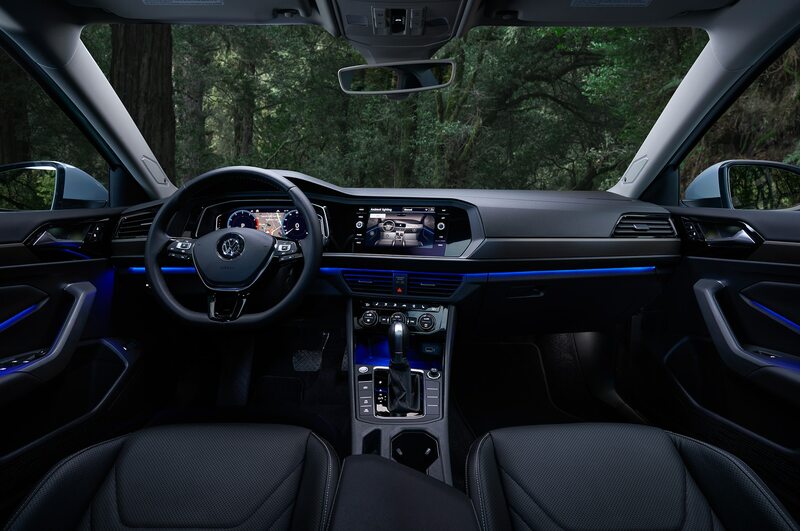 There are little upmarket touches scattered throughout the order form, including a panoramic sunroof, remote start, ventilated seats, and neat-o customizable ambient lighting with ten distinct colors. 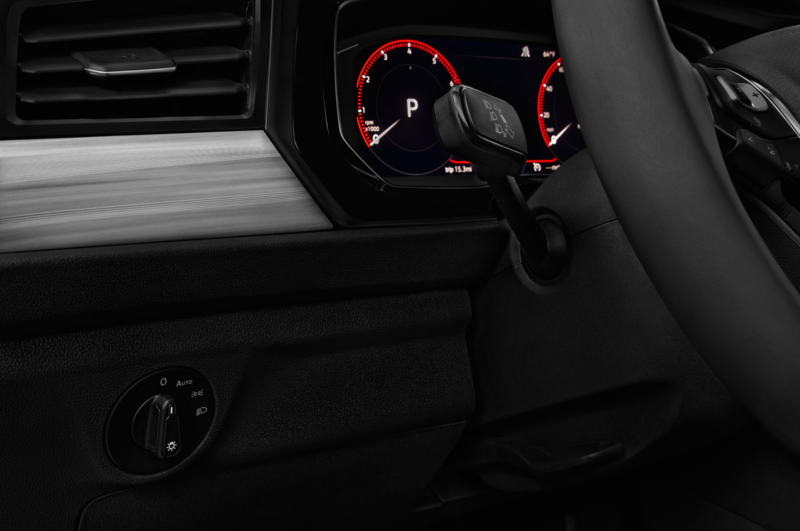 For the brand-junkies among us, the available premium sound system is developed with the team at Beats. 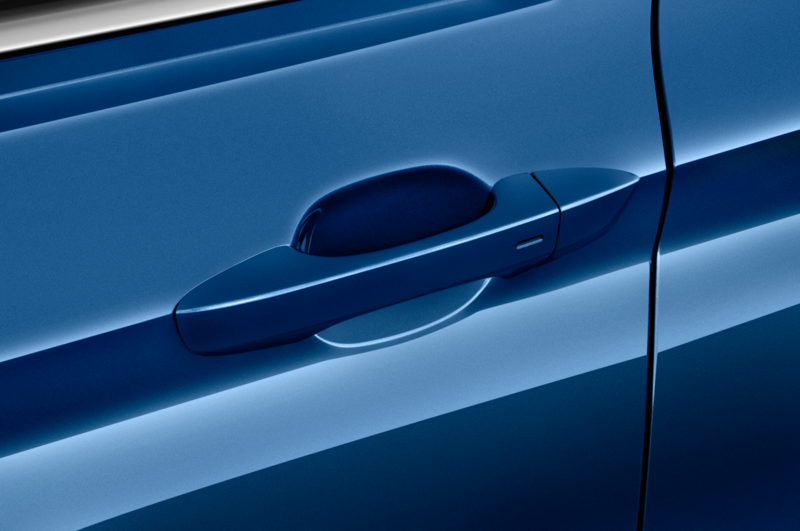 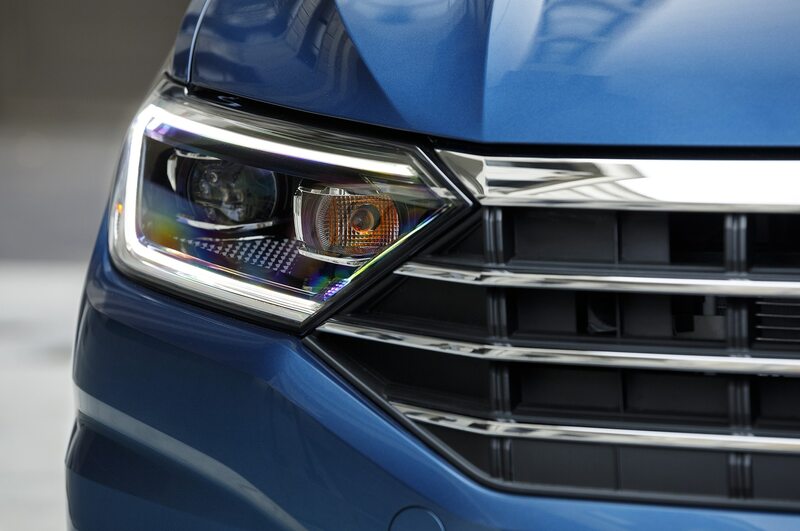 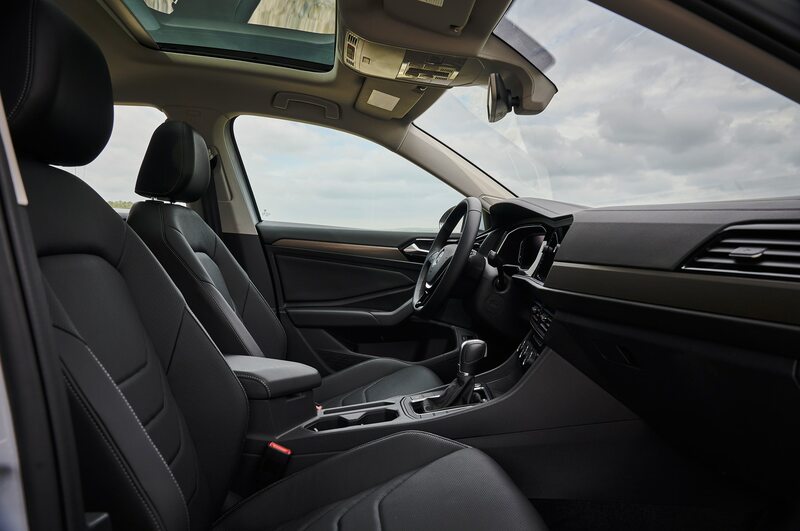 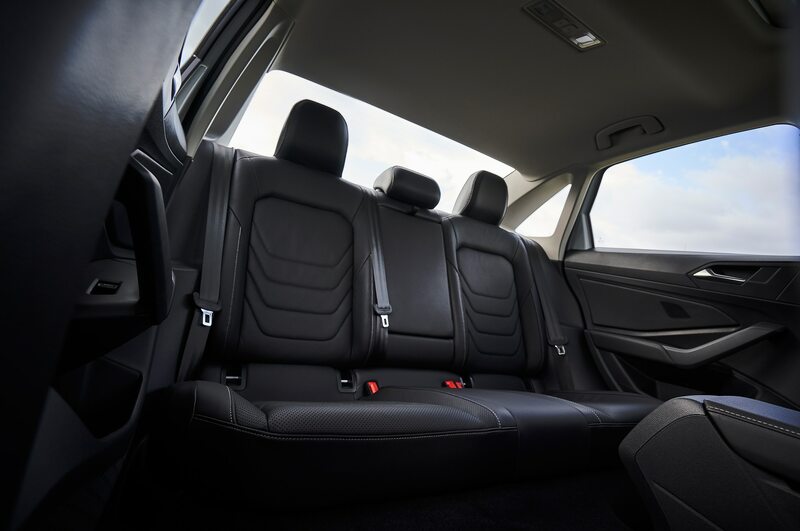 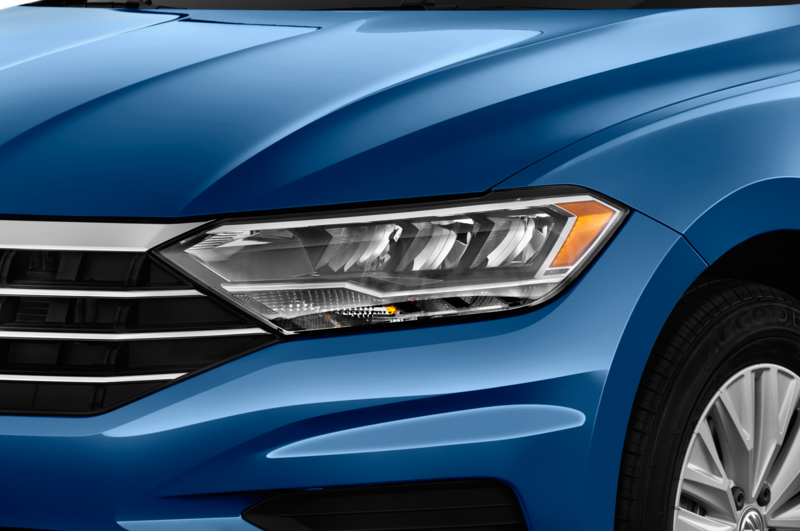 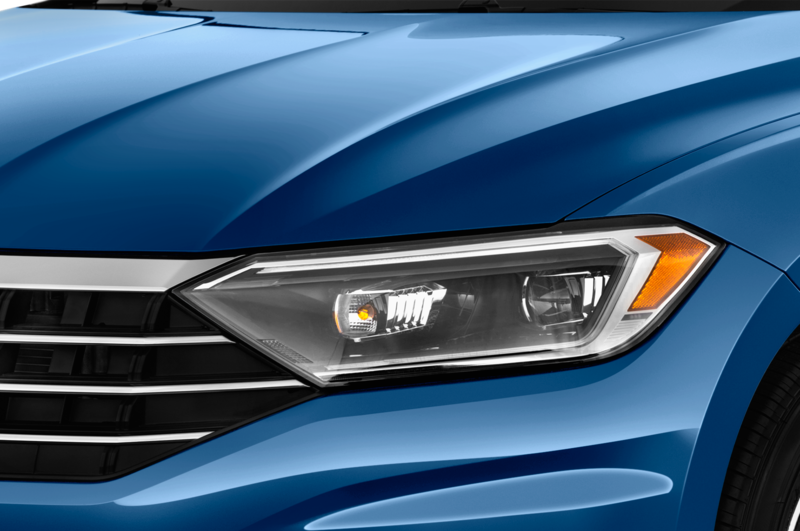 Get too distracted by all this restrained design and the Jetta will step in to prevent you from mussing up the shiny new metalwork. Spec it correctly and the car comes loaded with a suite of driver assistance systems, including forward collision warning and braking, blind spot monitor, rear cross-traffic alert, lane keep assist, and automatic high beams. 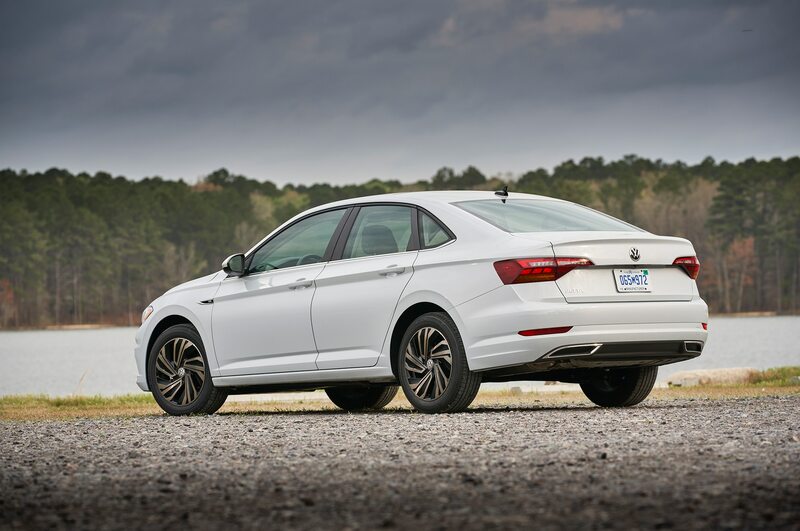 Two engines were cut from the model lineup, with only the 1.4-liter turbocharged four-cylinder available at launch. 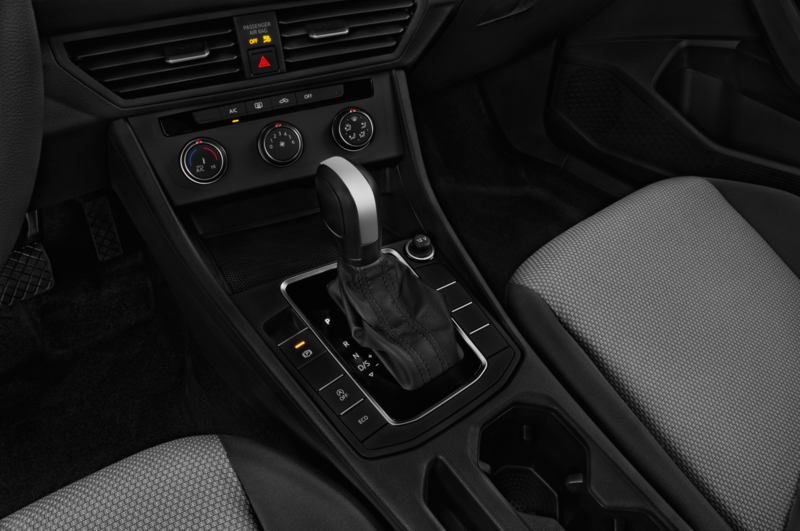 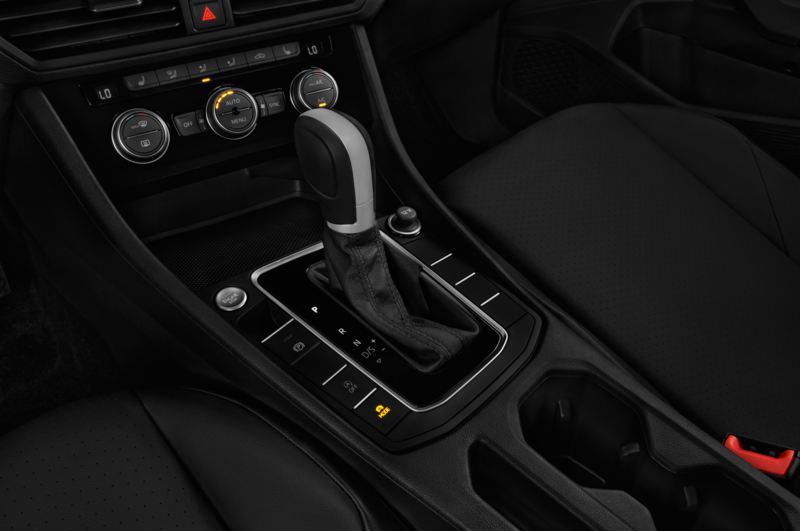 Power is routed to the front wheels through either a six-speed manual transmission (but only on the base S) or an all-new eight-speed automatic. 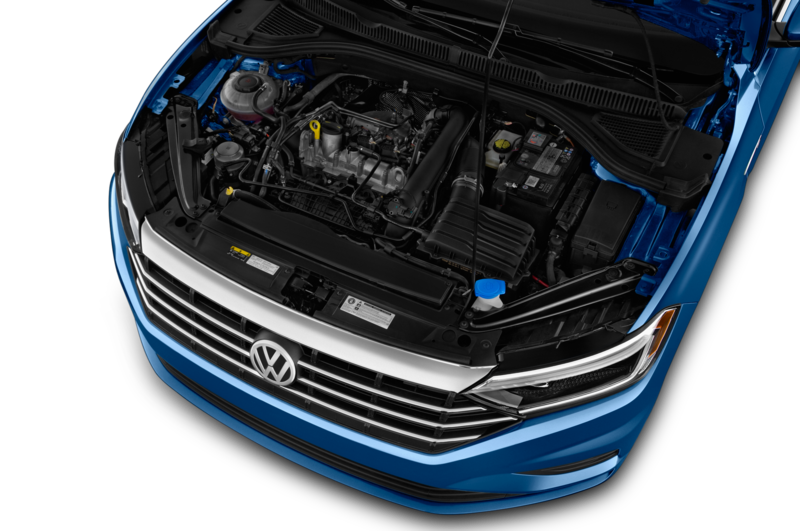 Power is a modest 147 hp, but torque is a semi-meaty 184 lb-ft. 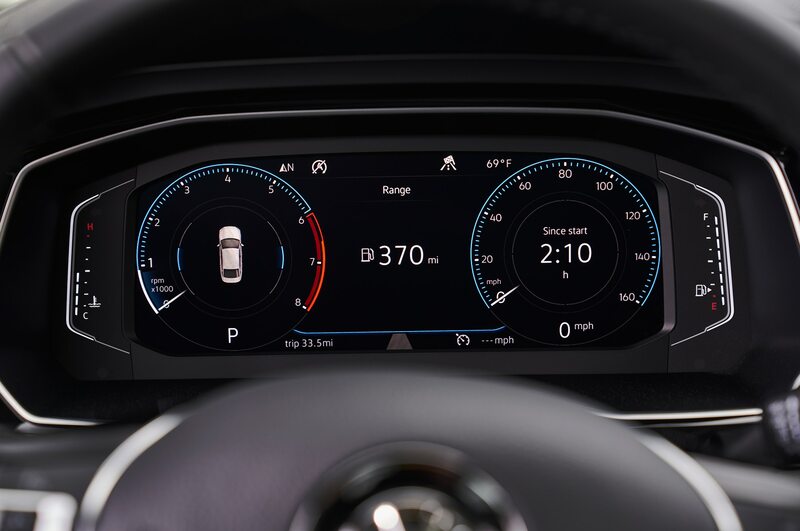 These figures won’t convert the GTI crowd but VW confirms the performance GLI is on the way, likely with a variant of the 2.0T from the aforementioned hot-hatch. 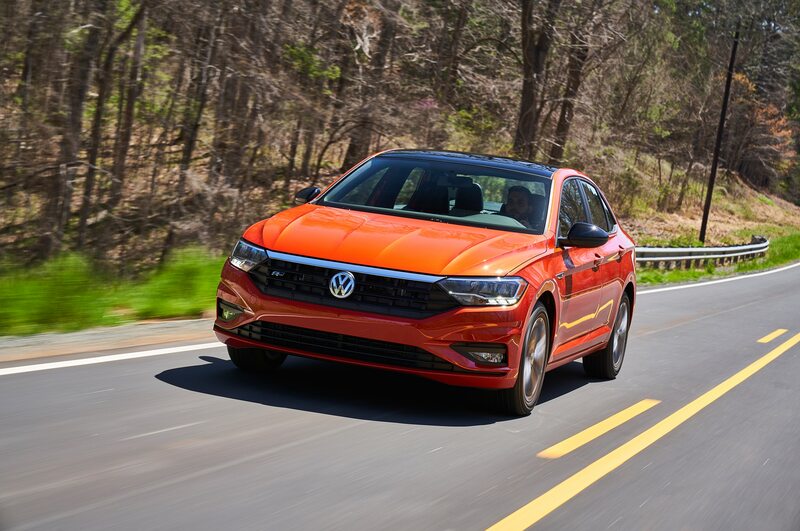 With this mechanical motivation turning the front wheels, the 0-60 sprint is handled in a face-flattening “who cares.” What’s more impressive for cars of this ilk and for the people who drive them is a moderate 0-45 mph scramble around town. 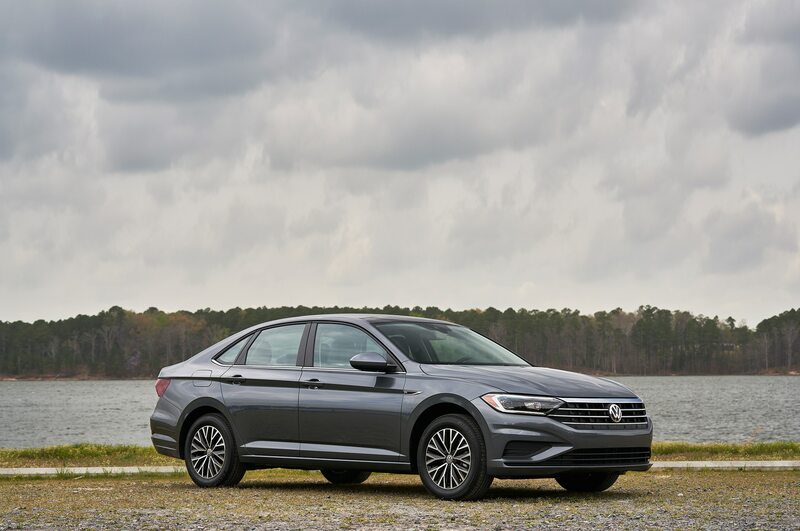 VW says all 184 of those torques arrive at a lowly 1,400 rpm, giving the not-so-little sedan some low-effort punch that pulls beyond what the diminutive displacement might suggest on paper. 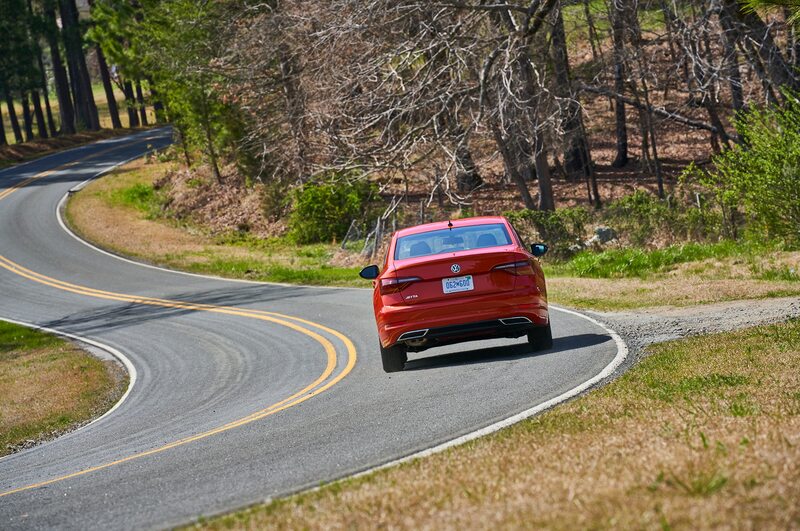 Hit the entrance ramp and the eight-speed works hard to eke out every little pony, Shetland or otherwise. 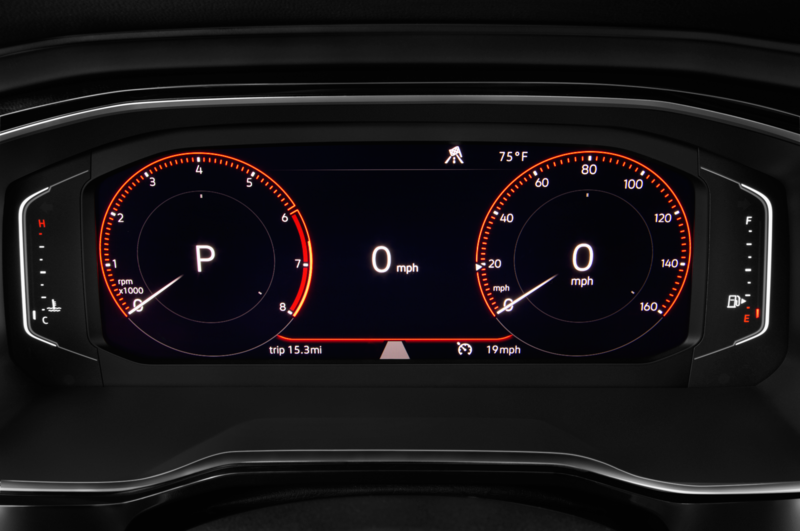 If you positively have to know, I’d reckon it takes around eight seconds or so to scrape the 60 mph barrier, so keep your foot in it. An earlier drive program with camouflaged Jetta prototypes revealed the top speed around 127 mph, if that matters. 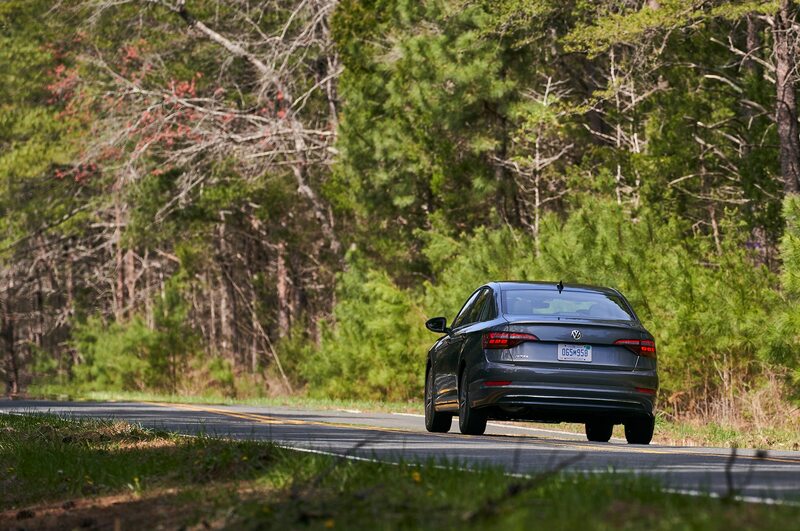 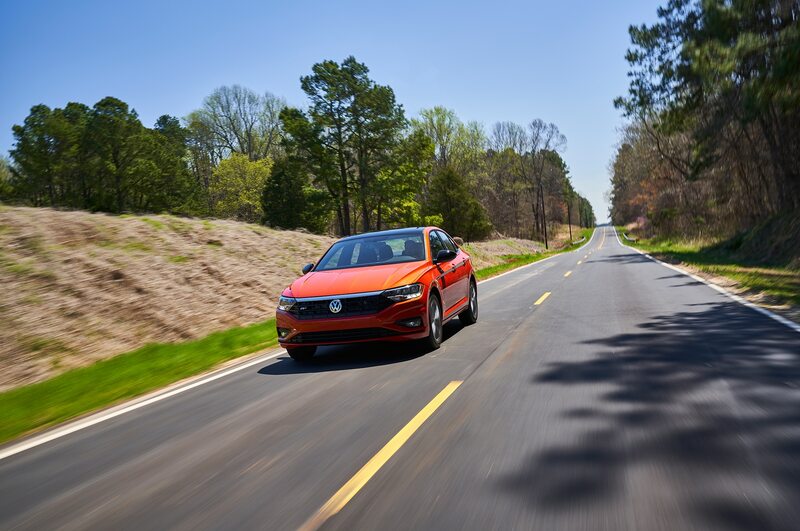 Out on the Loblolly pine-lined roads outside of Durham, it’s nice to see the Americanized Jetta still bleeds black-red-yellow. 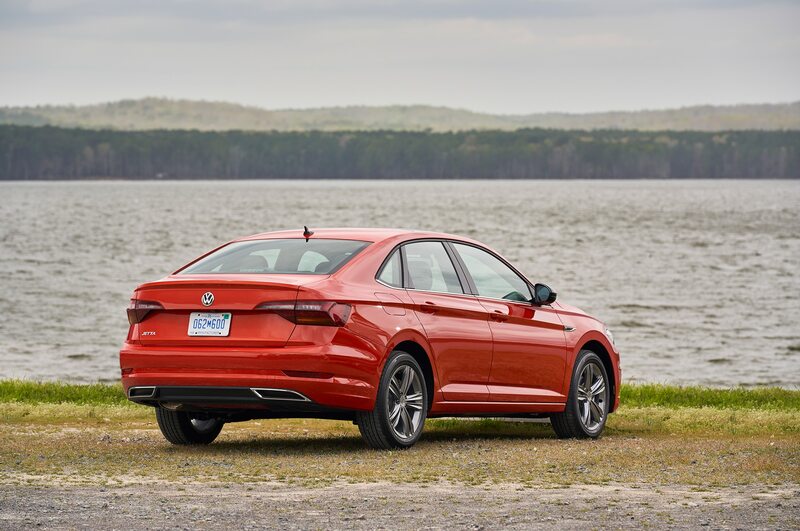 It’s typically Teutonic, with a drive experience that feels better bolted down than rivals from Japan or the States, even if it isn’t. 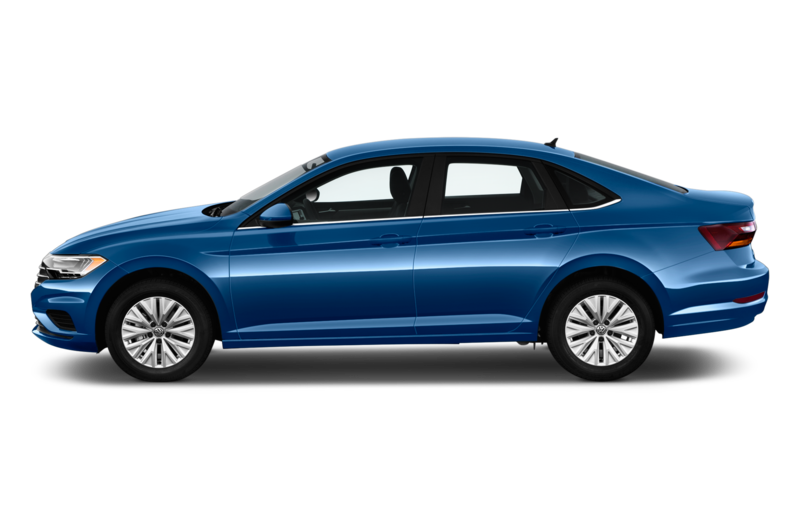 The Mk. 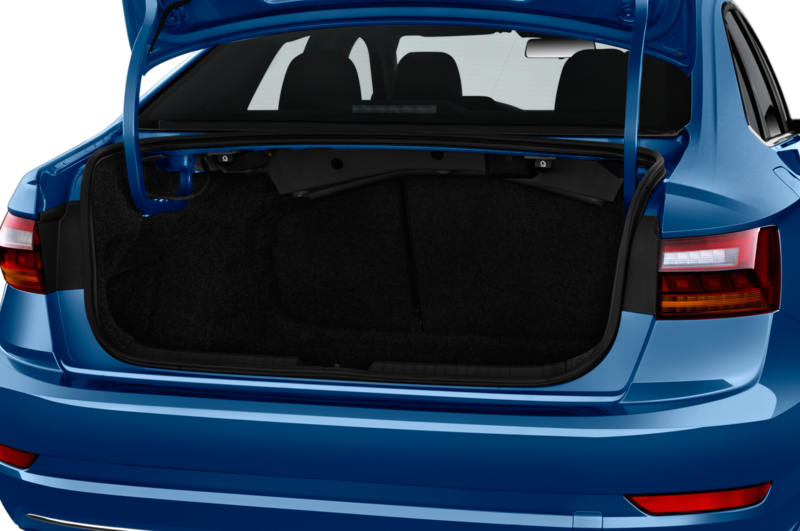 7 sticks with a torsion-beam rear suspension, a noticeable departure from its Korean and Japanese counterparts, but it’s still as cheerful to drive as previous Jettas were, with predictable electronically assisted steering and those excellent MQB underpinnings. 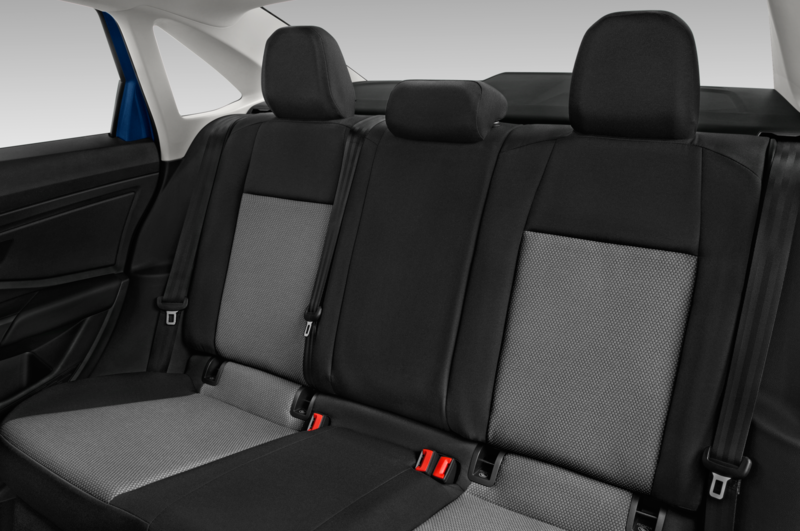 Despite the cushy ride and bigger interior custom tailored for Shake Shack’s largest market, it’s a snappy little car. 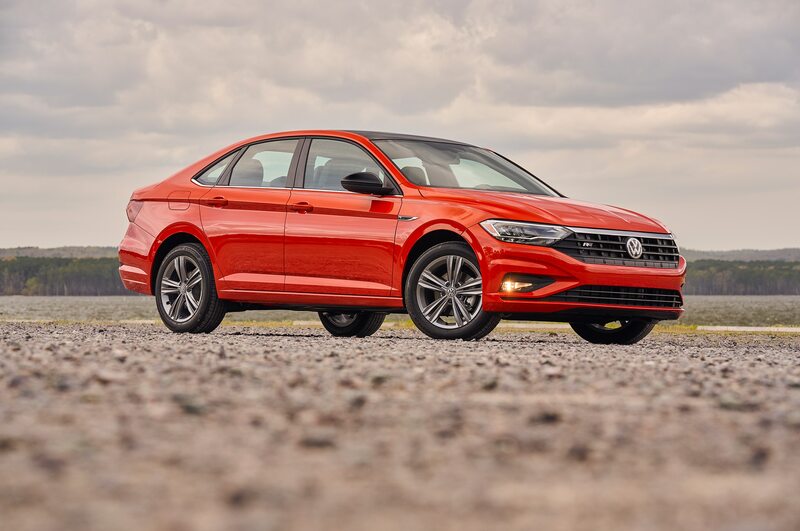 For the moment, the bog-standard engine is fine, but the eight-speed can be slightly excitable, especially with its readiness to upshift as soon as possible. 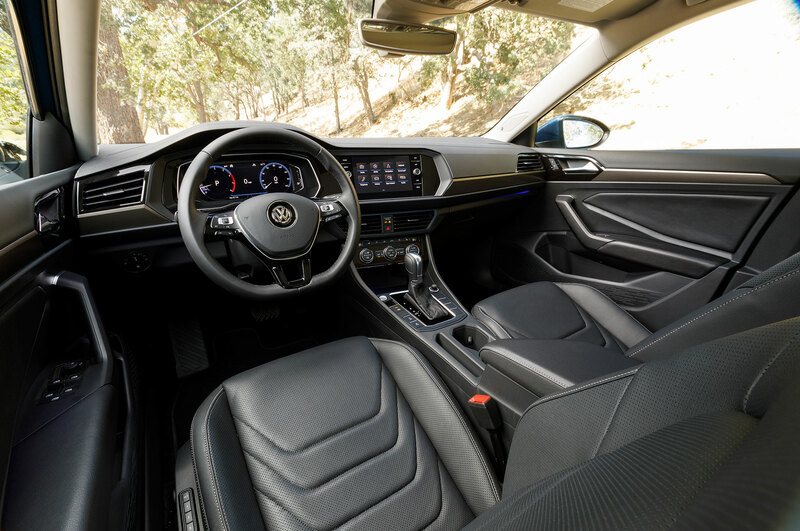 I didn’t get any seat time in the prototype Jetta fitted with the six-speed, but I’m sure for interested enthusiasts, that’s the one to get. 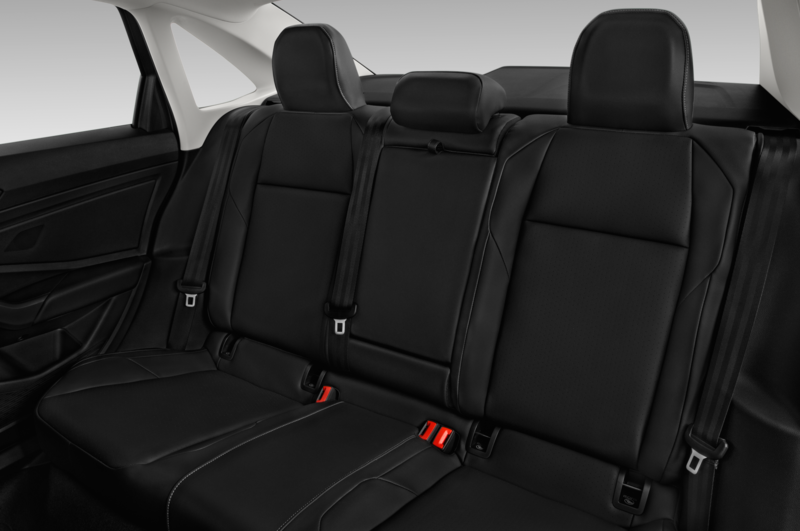 Depending on trim, it’s cheaper than the outgoing generation. 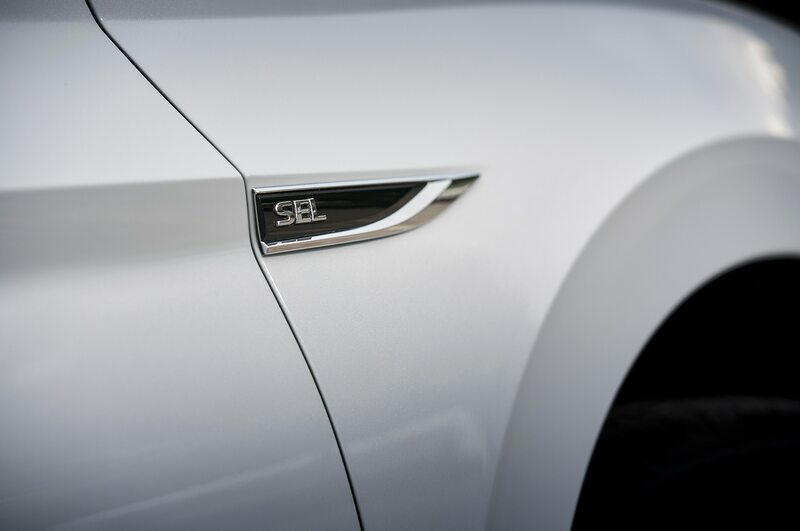 For a bargain-basement stripper S with a manual, expect to pay $19,395, jumping to $20,195 for an S with the new eight-speed. 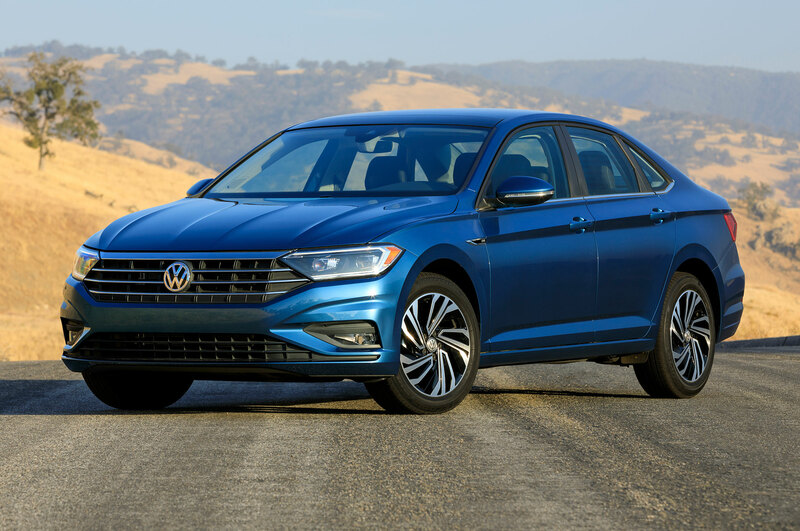 The $23,005 SE cuts $90 from the MSRP, and the $25,265 SEL chops an impressive $1,830, but a portion of that is likely from redistribution of features, thanks to a new range-topping SEL Premium trim that starts at $27,795. 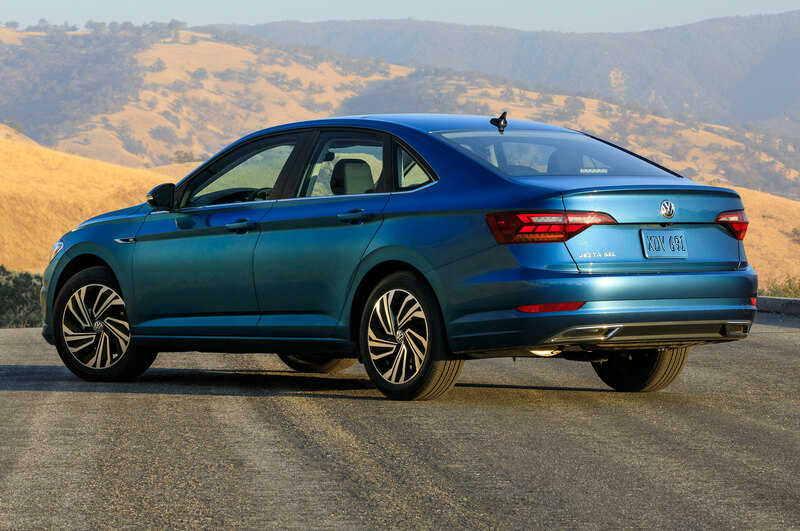 For a market increasingly obsessed with SUVs, a well-rounded compact sedan strangely begins to feel special. 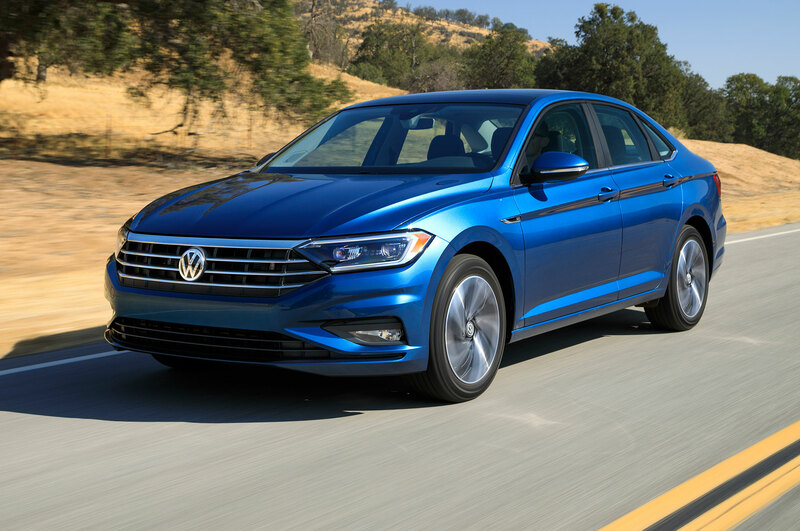 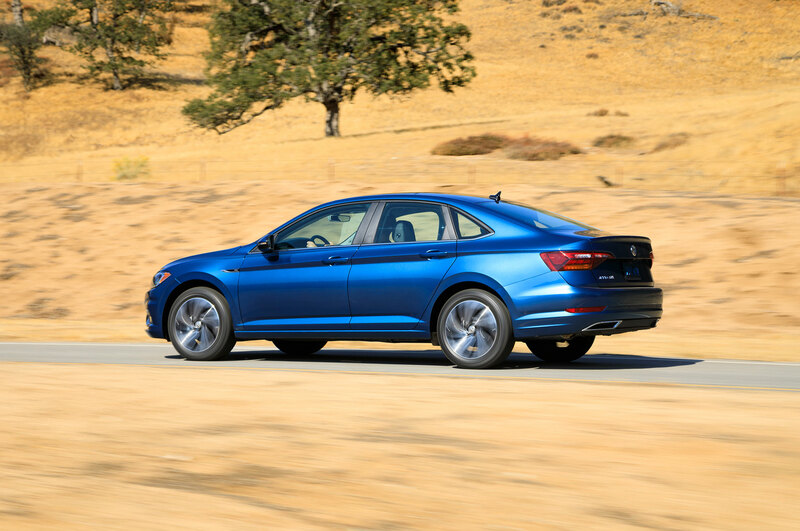 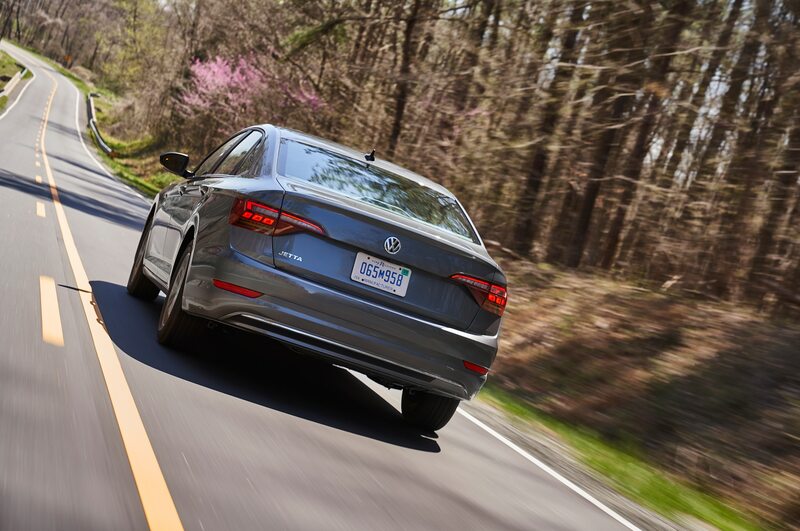 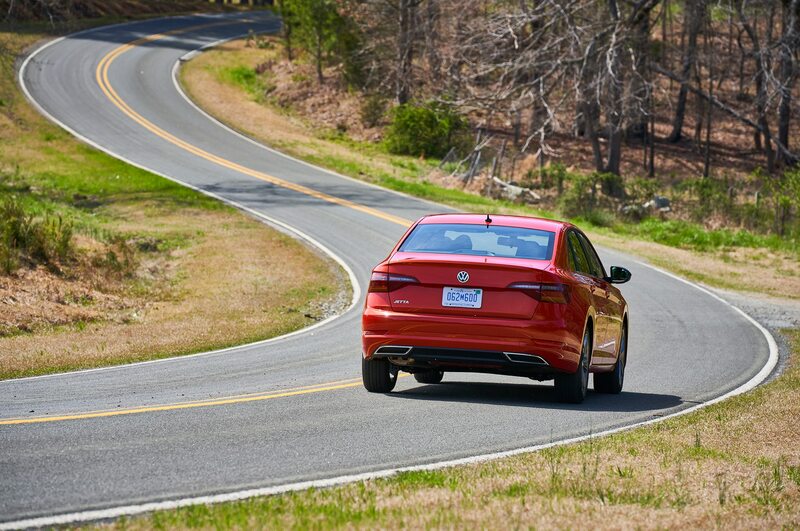 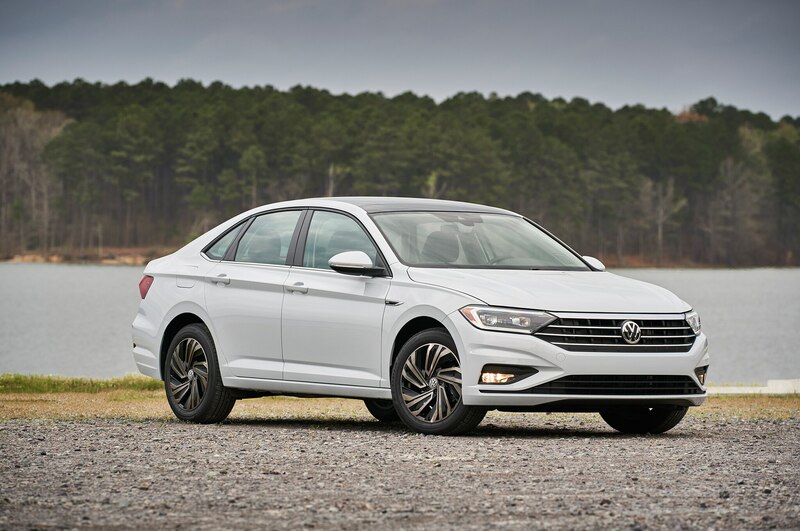 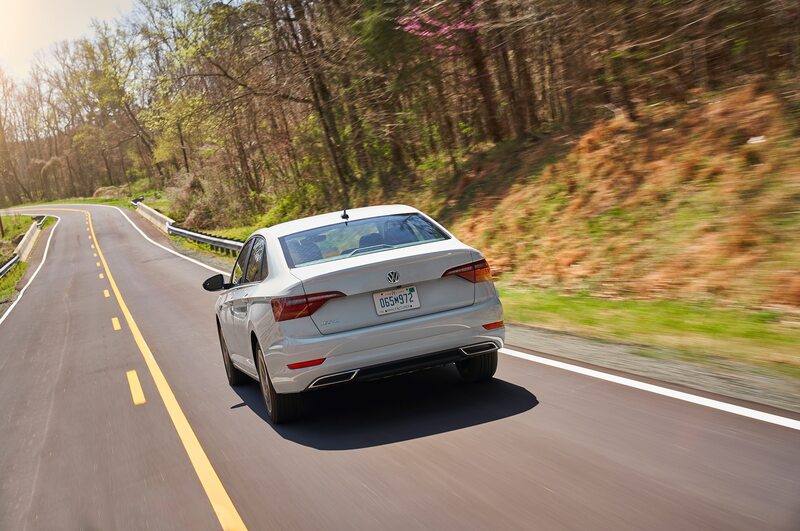 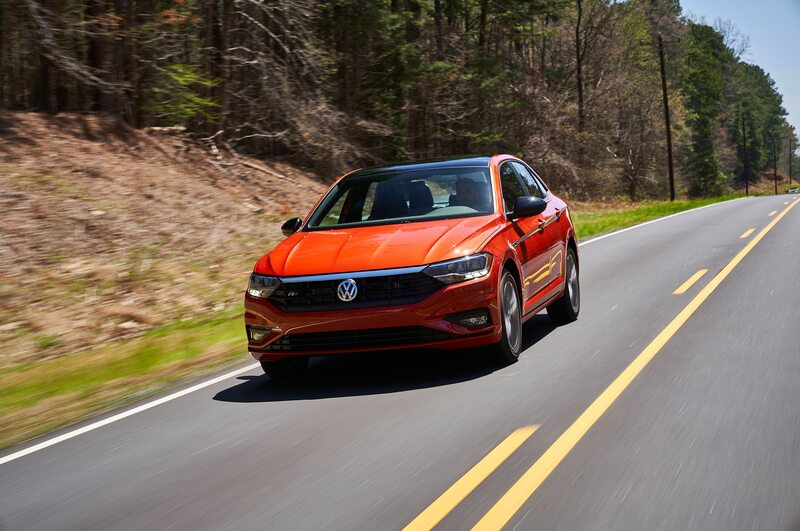 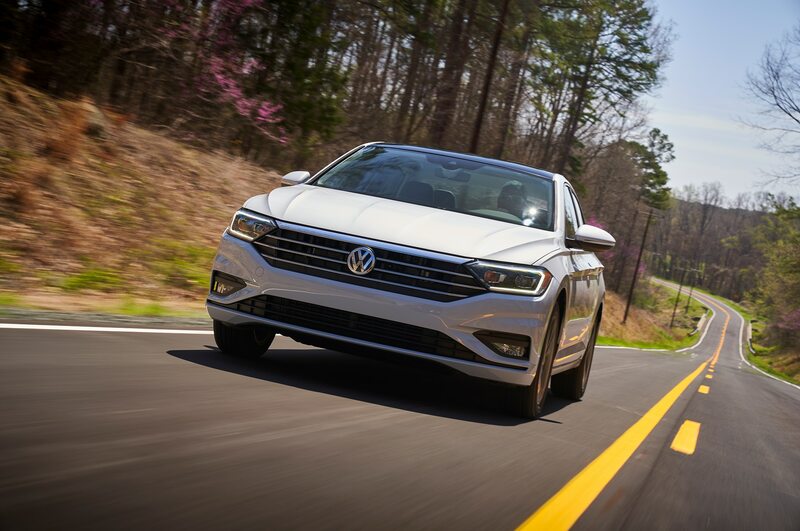 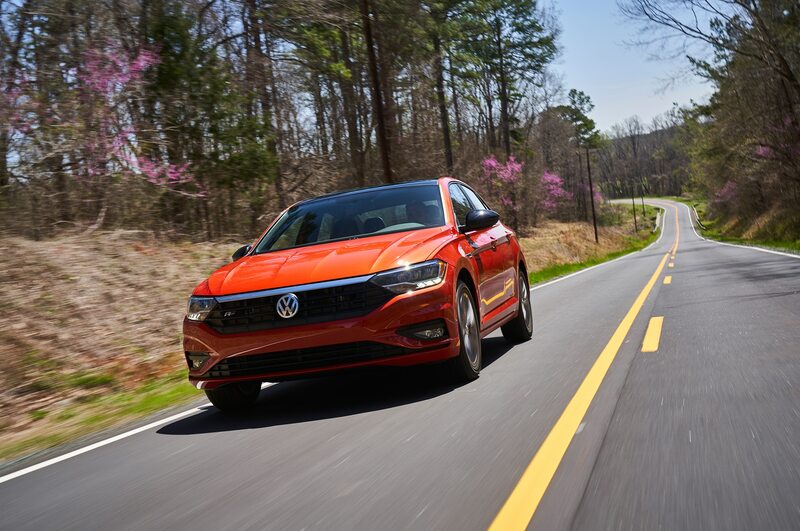 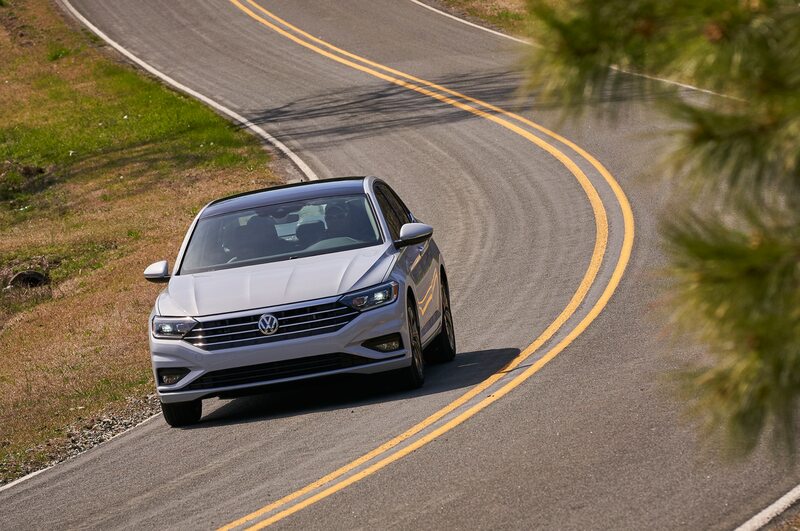 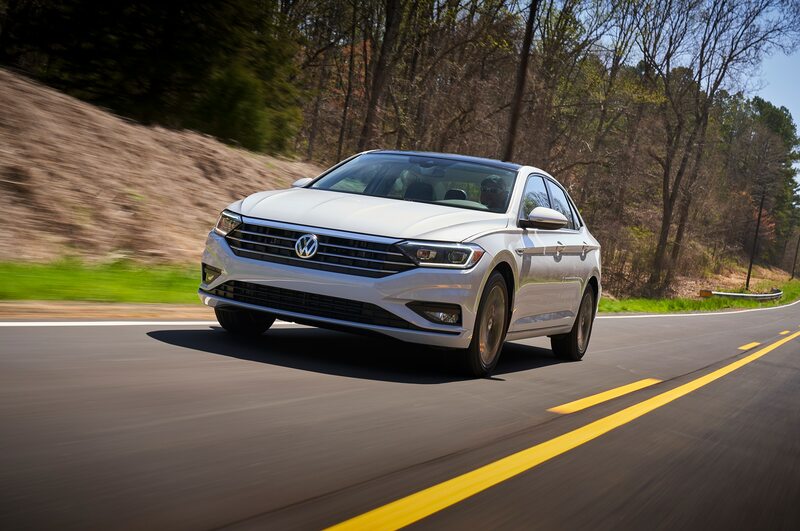 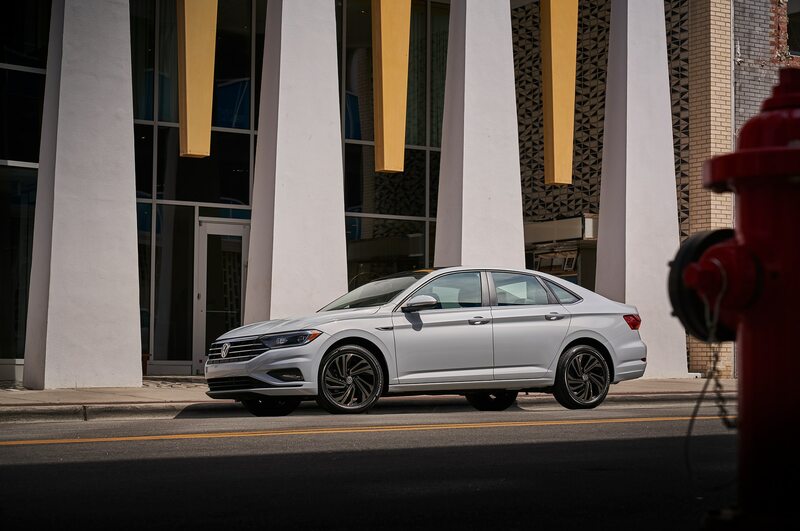 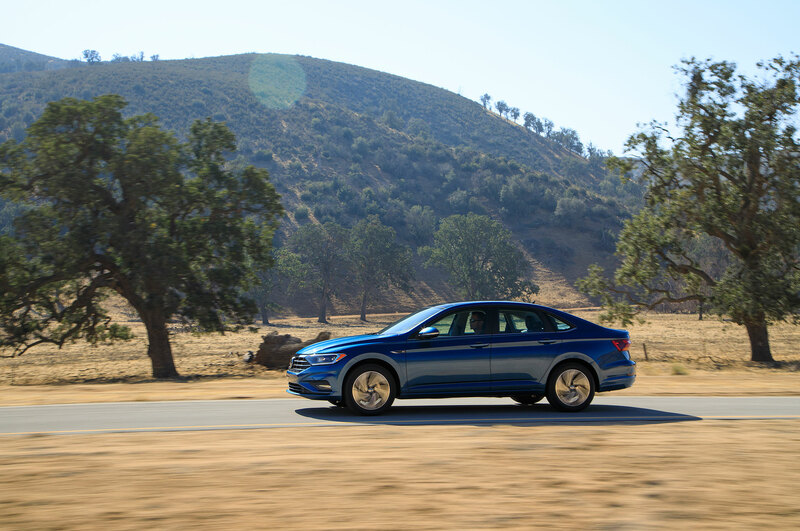 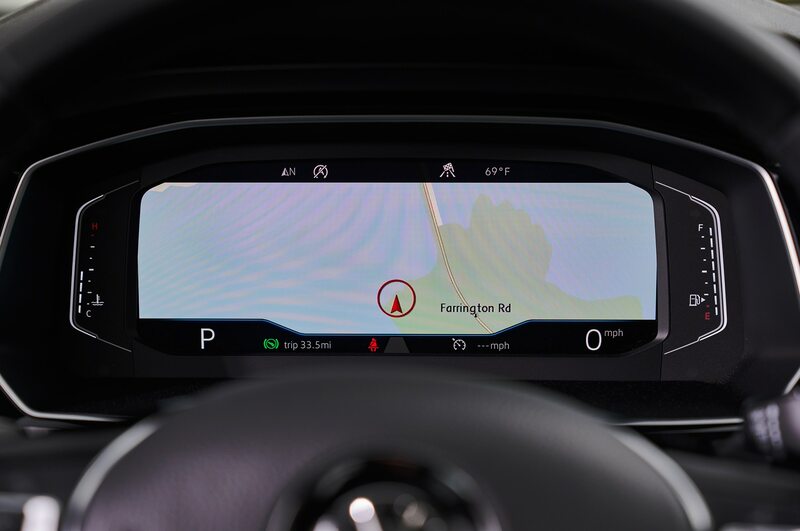 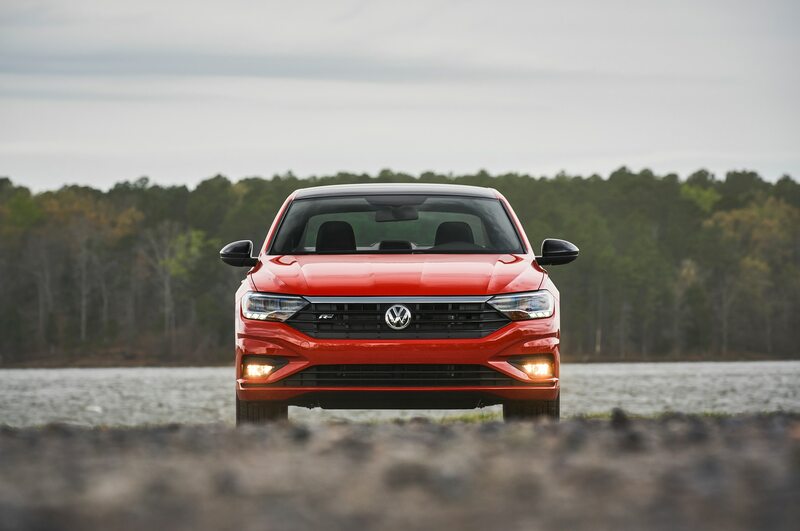 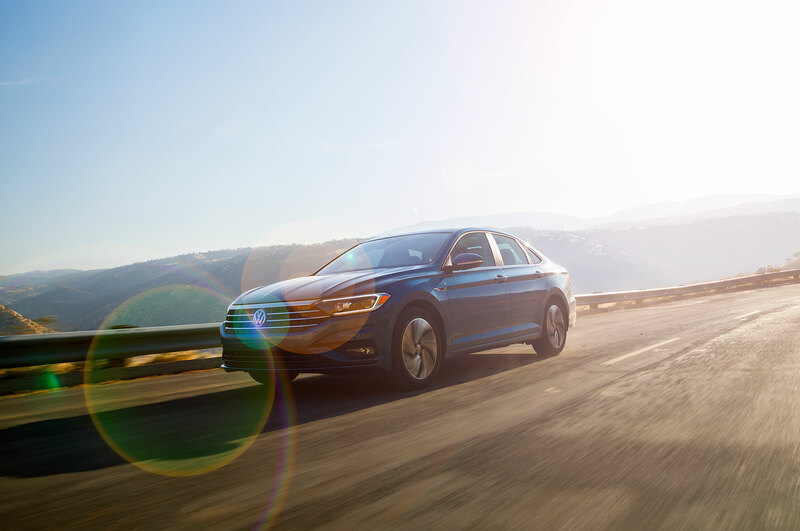 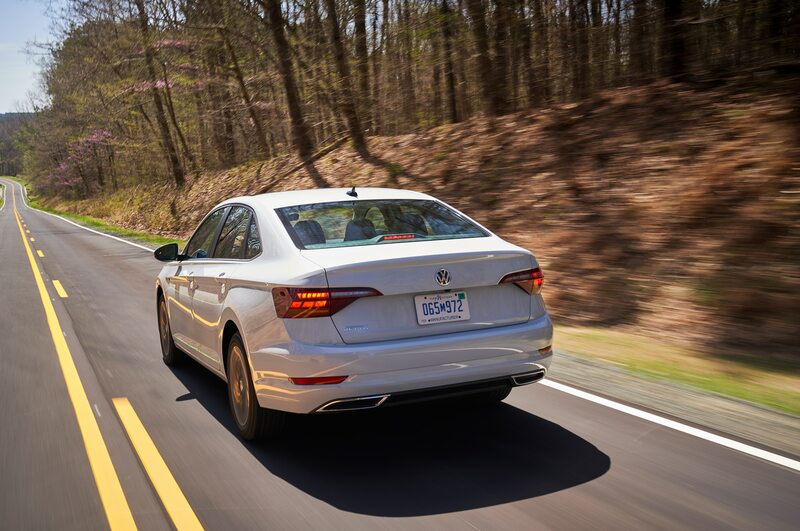 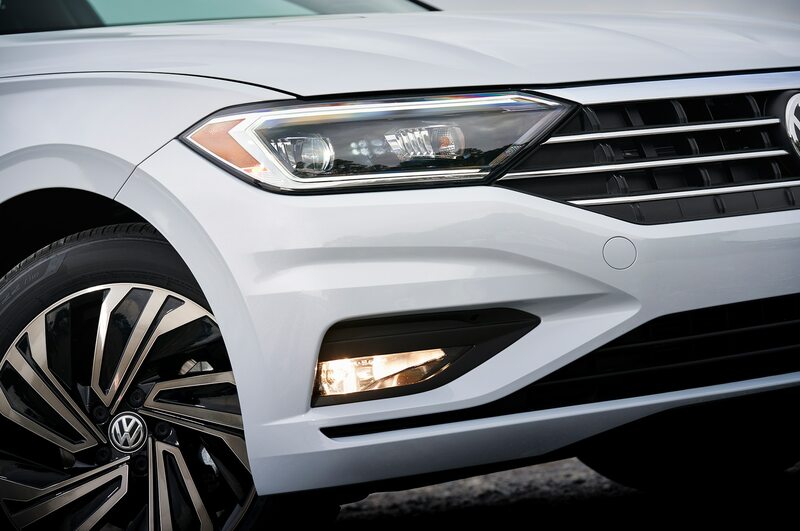 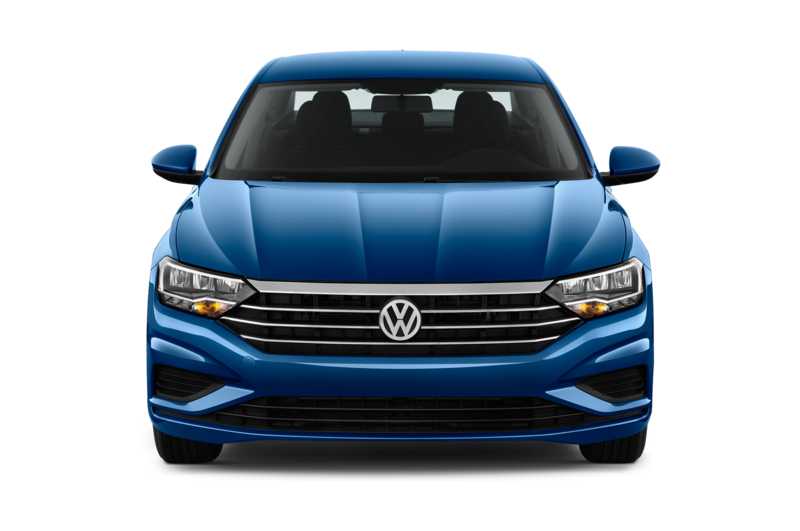 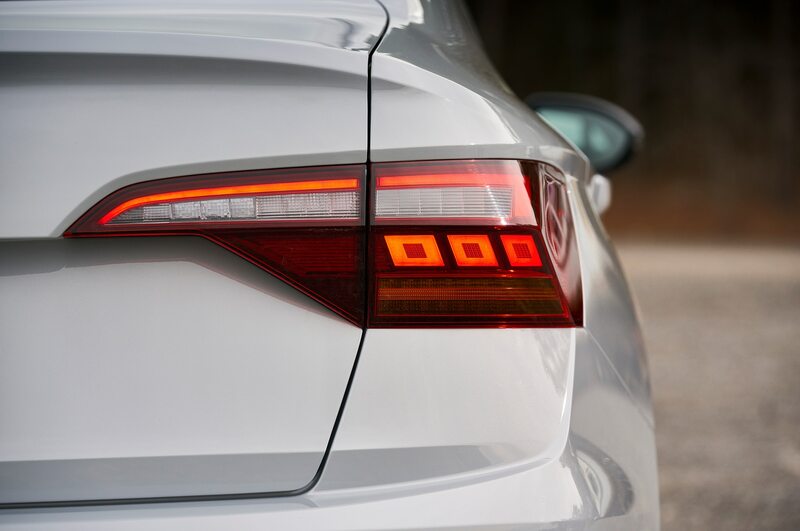 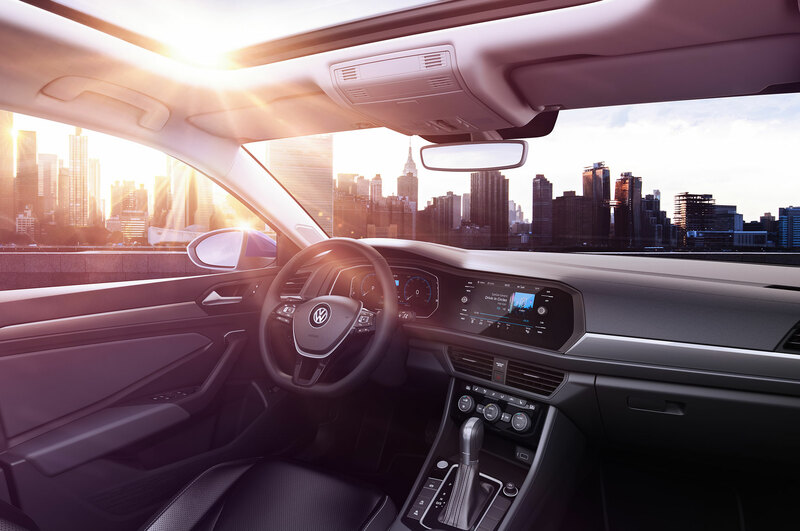 In spite of the U.S.-centric changes, the 2019 Volkswagen Jetta remains one of the sweet spots in the automaker’s lineup, especially with the promise of a performance oriented Jetta GLI on the horizon.